Designed in 1936, the building was completed on April 22, 1939. The Research Tower was designed in 1944, construction began in 1947 and the opening ceremony was held on November 17, 1950. 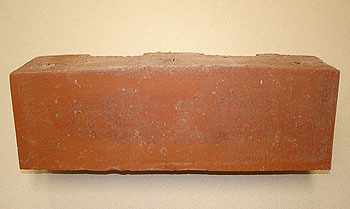 Title: Original Bricks from the S.C. Johnson & Sons Administration Building (1936) (S.237). Description: Five straight and two curved. 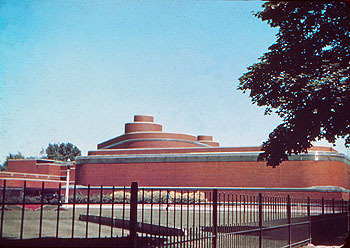 More than 200 sizes and shapes of bricks were used to form the angles and curves designed by Wright. For the color he specified Cherokee Red. The brick was trimmed with a lighter colored Kasota stone. The mortar in the horizontal joints was raked. The Great Workroom covers nearly one-half acre. 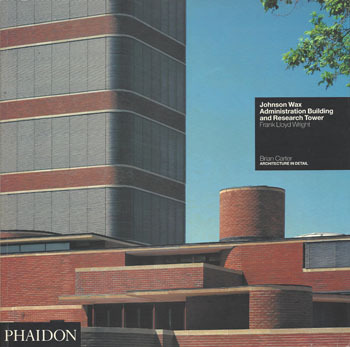 Johnson chose a friend Ben Wiltscheck to build the new building (Frank Lloyd Wright and the Johnson Wax Building, Lipman 1986, p32.4). After Johnson and Wiltscheck rejected the brick factory in Racine, Wright selected the Streator Brick Company in Streator, Illinois (p38.1). In 1947 construction began on the 14-floor Research Tower. In 1947 construction began on the 14-floor Research Tower. 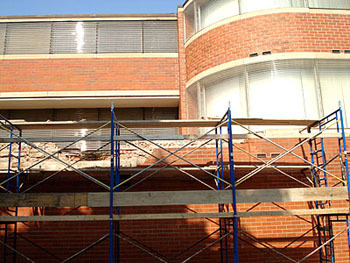 In 2007 restoration to the Administration Building was initiated and these were carefully salvaged and cleaned. Description: "We call the house �Wingspread� because spread its wings it would." - Frank Lloyd Wright. An in-depth descriptive pictorial book with sections that touch on the home and its history. It also includes: The roots of the family; Wingspread�s site; Wingspread�s plan; The construction; The home; The conference center and Materials. Description: Johnson Wax Flyer announcing �Meeting & Tour of the Johnson Wax Corporate Headquarters: Frank Lloyd Wright, Architect.� Includes tour and dinner. 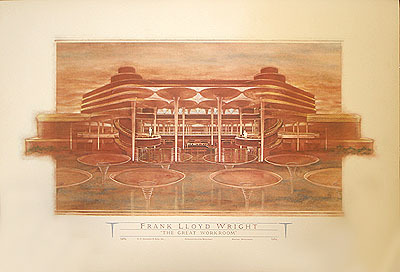 Title: Frank Lloyd Wright: Johnson Wax Building (Published by the Herbert F. Johnson Museum of Art, Cornell University). Description: Exhibit Brochure: �Creating a Corporate Cathedral�. For the traveling exhibit (1986-1988). Includes five photos and illustrations. 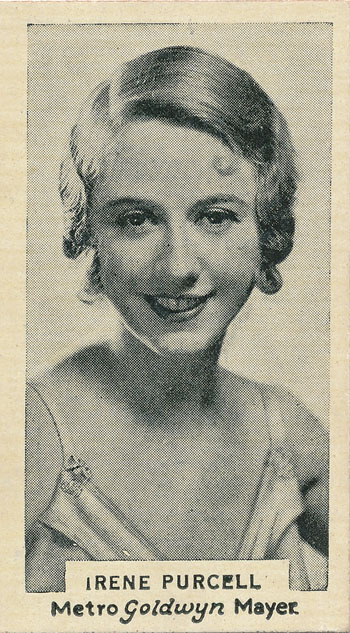 Title: Irene Purcell (Mrs. Johnson) Tobacco Card 1934. 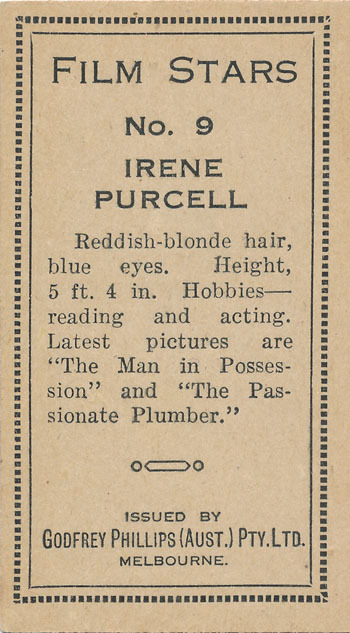 Description: Irene Purcell (1896 � 1972) was an American actress. Samuel C. Johnson formed the S. C. Johnson Company in 1886. At his passing, his son Herbert Fisk Johnson Sr. became president in 1919. 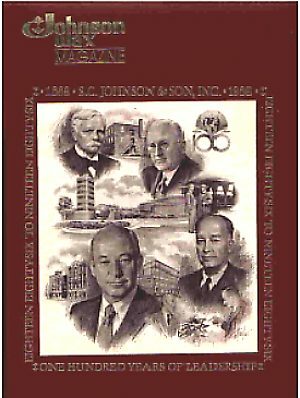 At Herbert Sr.�s death in 1928, Herbert Fisk Johnson Jr. became president of S. C. Johnson. In 1936, he commissioned Frank Lloyd Wright to design the S. C. Johnson Administration Building (1936 - S.237). In 1937 he commissioned Wright again to design in home Wingspread (1937 - S.239). In 1941, Herbert Fisk Johnson Jr. married Irene Purcell. They lived together at Wingspread, Racine, Wisconsin, and she past away in Racine in 1972. Text on face: "Irene Purcell. Metro Goldwyn Mayer." Text on verso: "Film Stars. No. 9. Irene Purcell. Reddish-blonde hair, blue eyes. Height, 5 ft 4 in. Hobbies � reading and acting. Latest pictures are �The Man in Possession� and �The Passionate Plumber.� Issued by Godfrey Phillips (Augt.) Pty. Ltd. Melbourne." 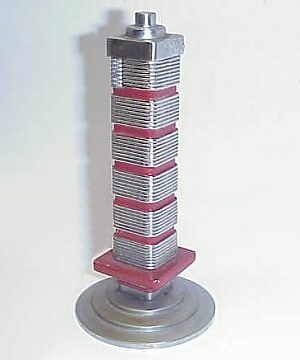 Title: Johnson�s Wax Tower Lighter. Description: In 1999 I contacted the SC Johnson Archive Department. According to their records, these were produced in 1947, and some were given away at that time as Christmas gifts. One was sent to Frank Lloyd Wright which lead the archivist to believe that he had nothing to do with the lighter project or he would probably have gotten an advanced copy (that was the practice). In 1948, more were given out as Christmas gifts. When the Tower was dedicated on 11/17/50, Mr. Wright was in attendance. 250 were invited. 200 accepted, and each were given a lighter as a memento. Title: Barrel Chair Key Ring 1996. Description: Frank Lloyd Wright first designed the Barrel chair for the Darwin Martin Residence. (S.100 - 1904). Slight modifications were made to the design for the Herbert F. Johnson Residence, Wingspread (S.239 - 1937). 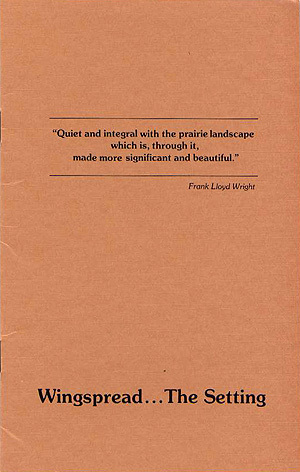 Descriptive card: "Inspired from the design of Frank Lloyd Wright." Inside: "Barrel Chair Key Ring. 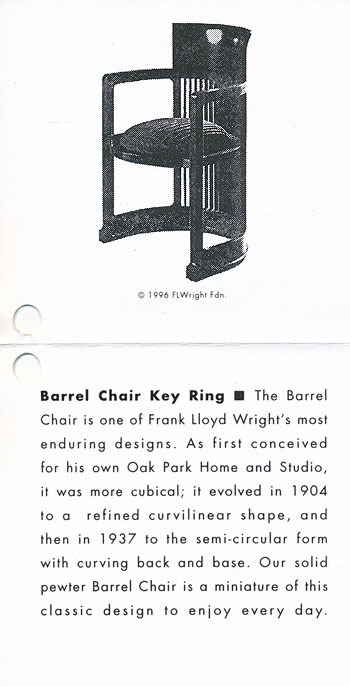 The Barrel Chair is one and Frank Lloyd Wright's most enduring designs. 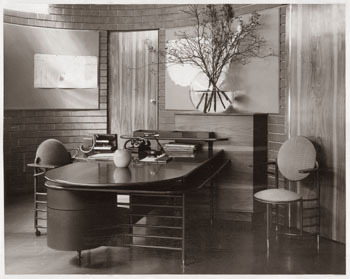 As first conceived for his own Oak Park Home and Studio, it was more cubicle; it evolved in 1904 to a refined curvilinear shape, and then in 1937 to the semi-circular form with curving back and base. 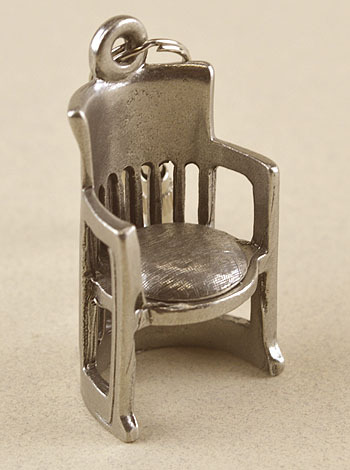 Our solid pewter Barrel Chair is a miniature of this classic design to enjoy every day." Stamped under seat: "Pewter." Made of pewter. Original list price $16.00. Size: 1" wide x 1.5" high x .875" deep. 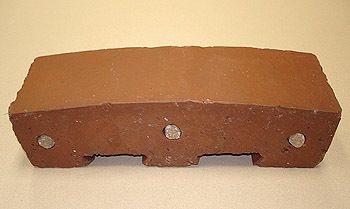 Title: S. Johnson Building Model. 1936. Description: Designed in 1936, the building was completed on April 22, 1939. The Research Tower was designed in 1944 and construction began in 1947. Caption on back: "Now in Wisconsin. For years Frank Lloyd Wright designed unique buildings in many parts of the world. 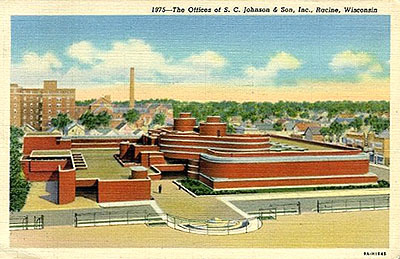 He planned this factory of the Johnson & Co., Racine. It combines straight and curved lines, built without ornamentation, yet with a trim beauty of its own." 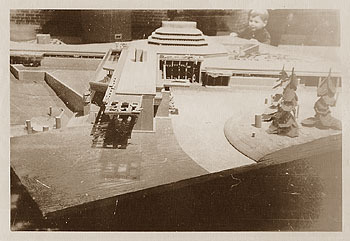 Additional images of model in "Frank Lloyd Wright and The Johnson Wax Building" Lipman, page 36. "At the end of August Wright guided three of his apprentices Blaine and Hulda Drake, and Eugene Masselink, in the construction of a large, detailed model of the Administration Building that could be separated into two halves, allowing one to peer into a miniature Great Workroom." Construction of the model lead Wright to make changes to the design. Page 37. Paul�s Photos. 3702 N. Lakewood Avenue, Chicago 13, Illinois. "GF-901". Original silver gelatin photo. 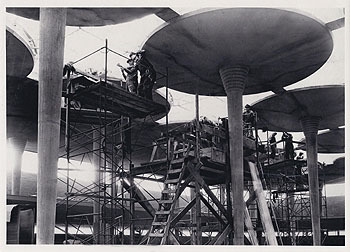 Title: S.C. Johnson Headquarters, preparation for the "Dendriform Column Test," 1937 (1936 - S.237). Description: The actual test took place on June 3-4, 1937. This would have been taken a few days before that. Scaffolding for the test column for can be seen in the center. Reusable metal column forms are setting to the left of the scaffolding. 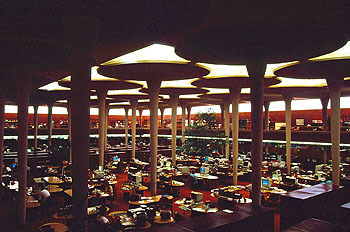 Similar view published in Frank Lloyd Wright and the Johnson Wax Buidlings, Lipman, 1986, p.58. Size: Original 10 x 8 B&W photograph. Title: S.C. Johnson Headquarters "Dendriform Column Test" June 3-4, 1937 (1936 - S.237). 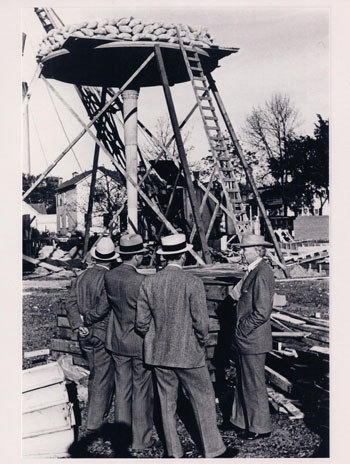 Description: Frank Lloyd Wright (right) stands with Contractor Ben Wiltscheck (far left), HF Johnson, Jr. (Center), during the testing of the dendriform column. The Wisconsin Industrial Commission denied permission to build the columns. According to builders a column with a nine-inch diameter at the base, could only support a maximum column height of 6 feet 9 feet. The nine-inch diameter of the Wright column carried a height of 21 feet 7.5 inches. Finally it was agreed that a test column would be built, and if it carried 12 tons, construction would proceed. A full scale mockup was created to specifications. According to The Milwaukee Journal, June 4, 1937, "Wisconsin�s internationally famous architect, Thursday (June 3) won the first round of an encounter with the Wisconsin Industrial Commission. He successfully loaded 24 tons of sand on the top of a test column which he designed for the new administration building of the S. C. Johnson & Sons Wax Co., at Racine without cracking the pillar." At twelve tons the commission was satisfied. But Wright was not. "At 6 p. m. the structure was still standing, and plans were made for continuing the test Friday, adding weight until the column crashes." According to Jonathan Lipman, "At thirty tons, enjoying the drama, Wright directed the loading crew, �Keep pilling.� At 60 tons, and no room to add more, Wright had the column pulled down. Label pasted to verso: "Brown University Department of Art, Providence, Rhode Island. 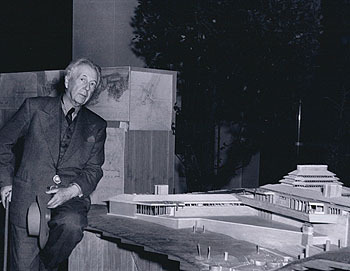 From the Exhibition: Frank Lloyd Wright and the Johnson Wax Buildings (1986). 1937 photographs of Wright (right) watching his experimental dendriform column being test loaded." Acquired from the Brown University. Size: Original 8 x 10 B&W photograph. Description: Frank Lloyd Wright, HF Johnson, Jr. and Wes Peters sit on a stack of wood during the testing of the dendriform column. The Wisconsin Industrial Commission denied permission to build the columns. According to builders a column with a nine-inch diameter at the base, could only support a maximum column height of 6 feet 9 feet. The nine-inch diameter of the Wright column carried a height of 21 feet 7.5 inches. Finally it was agreed that a test column would be built, and if it carried 12 tons, construction would proceed. A full scale mockup was created to specifications. According to The Milwaukee Journal, June 4, 1937, "Wisconsin�s internationally famous architect, Thursday (June 3) won the first round of an encounter with the Wisconsin Industrial Commission. He successfully loaded 24 tons of sand on the top of a test column which he designed for the new administration building of the S. C. Johnson & Sons Wax Co., at Racine without cracking the pillar." At twelve tons the commission was satisfied. But Wright was not. "At 6 p. m. the structure was still standing, and plans were made for continuing the test Friday, adding weight until the column crashes." According to Jonathan Lipman, "At thirty tons, enjoying the drama, Wright directed the loading crew, �Keep pilling.� At 60 tons, and no room to add more, Wright had the column pulled down. 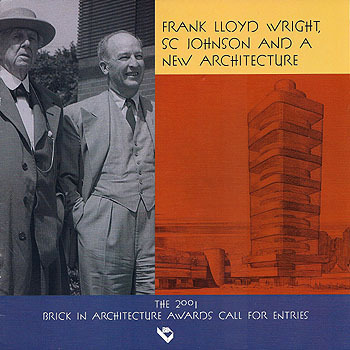 Wes Peters (left), Frank Lloyd Wright (center) and Johnson (right). Published in "At Taliesin" Henning, 1992, p.250. Two copies, One 10 x 7 B&W photograph. One original 10 x 7 B&W photograph acquired from Randolph Henning. Size: 10 x 7 B&W photograph. 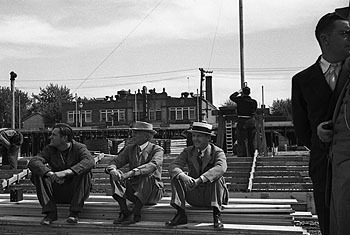 Description: Frank Lloyd Wright, HF Johnson, Jr. and Wes Peters sit on a stack of wood during the testing of the dendriform column. The Wisconsin Industrial Commission denied permission to build the columns. According to builders a column with a nine-inch diameter at the base, could only support a maximum column height of 6 feet 9 feet. The nine-inch diameter of the Wright column carried a height of 21 feet 7.5 inches. Finally it was agreed that a test column would be built, and if it carried 12 tons, construction would proceed. A full scale mockup was created to specifications. According to The Milwaukee Journal, June 4, 1937, "Wisconsin�s internationally famous architect, Thursday (June 3) won the first round of an encounter with the Wisconsin Industrial Commission. He successfully loaded 24 tons of sand on the top of a test column which he designed for the new administration building of the S. C. Johnson & Sons Wax Co., at Racine without cracking the pillar." At twelve tons the commission was satisfied. But Wright was not. "At 6 p. m. the structure was still standing, and plans were made for continuing the test Friday, adding weight until the column crashes." According to Jonathan Lipman, "At thirty tons, enjoying the drama, Wright directed the loading crew, �Keep pilling.� At 60 tons, and no room to add more, Wright had the column pulled down. Wes Peters (left), Frank Lloyd Wright (center) and Johnson (right). Size: Original 10 x 9 B&W photograph. Description: Frank Lloyd Wright and HF Johnson, Jr. On site during the testing of the dendriform column. The Wisconsin Industrial Commission denied permission to build the columns. According to builders a column with a nine-inch diameter at the base, could only support a maximum column height of 6 feet 9 feet. The nine-inch diameter of the Wright column carried a height of 21 feet 7.5 inches. Finally it was agreed that a test column would be built, and if it carried 12 tons, construction would proceed. A full scale mockup was created to specifications. According to The Milwaukee Journal, June 4, 1937, "Wisconsin�s internationally famous architect, Thursday (June 3) won the first round of an encounter with the Wisconsin Industrial Commission. He successfully loaded 24 tons of sand on the top of a test column which he designed for the new administration building of the S. C. Johnson & Sons Wax Co., at Racine without cracking the pillar." At twelve tons the commission was satisfied. But Wright was not. "At 6 p. m. the structure was still standing, and plans were made for continuing the test Friday, adding weight until the column crashes." According to Jonathan Lipman, "At thirty tons, enjoying the drama, Wright directed the loading crew, �Keep pilling.� At 60 tons, and no room to add more, Wright had the column pulled down. 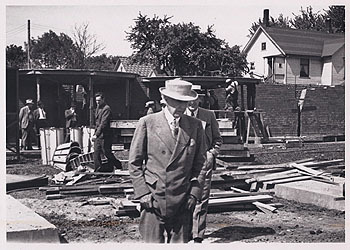 Frank Lloyd Wright in foreground, Johnson is behind him. 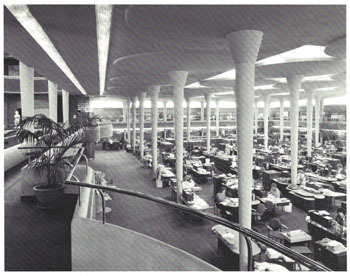 Title: S.C. Johnson Headquarters Great Room 1938 (1936 - S.237). Description: Workmen working on dendriform columns in the great workroom. Wooden forms are still in place, and it appears that the concrete has been poured. 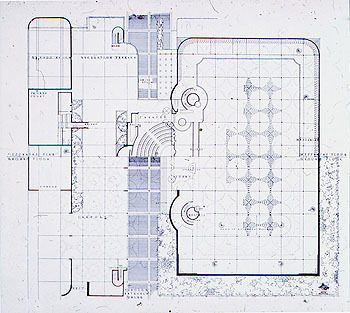 Similar image published in Frank Lloyd Wright and the Johnson Wax Buildings, Lipman, 1986, pp.78-9. Size: Original 7 x 5 B&W photograph. Description: Workmen installing Pyrex tubes in great workroom. 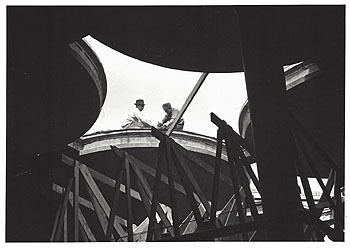 Label pasted to verso: "Title: 1938 photograph of the workmen installing Pyrex tubes in skylights of the Johnson Wax Administration Building Great Workroom. Date: 1938. 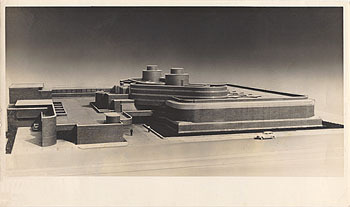 From the exhibition: Frank Lloyd Wright and the Johnson Wax Buildings (1986), circulated by the Smithsonian Institute Traveling Exhibition Service." 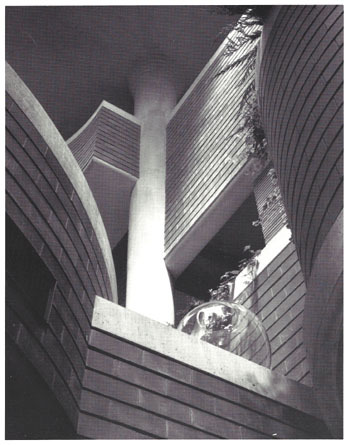 Published in Frank Lloyd Wright and the Johnson Wax Buildings, Lipman, 1986, pp.78-9. Title: SC Johnson Headquarters �Great Workroom�. Description: Ken Burns considered the Johnson Wax Headquarters �the greatest room in the United States today�. 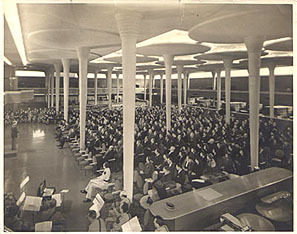 Herbert Johnson addresses the employees in the Great Workroom during the 1939 profit-sharing meeting. To his left is the company choir and to his right is the company band. Original silver gelatin photo. Published in �Frank Lloyd Wright and the Johnson Wax Building� Lipman 1986, page 118-119. Photographer unknown. Title: SC Johnson Headquarters 1939. Description: Porte cochere, viewed from the east. The loading dock is visible at the lower left. The glazed bridge from the penthouse to the squash court is located top center. Stamped on verso: "From Photographic Department, S.C. Johnson & Sons, Inc., Racine, Wis. Makers of Johnson�s Wax. Photograph by Roy E. Petersen." Clipping on verso: "June 8 - 1949. The Johnson Wax Co. building at Racine, Wis., designed by Wright. Architects have called it the greatest contribution to business housing since the advent of the skyscraper. It is built without windows and doors (other than the main opening) and is heated through the floor and supported by �golf-tee� columns, modeled on the structure of a flower." Also published: "Oct 30, 1964. 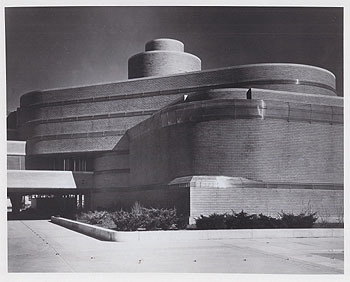 Another of Wright�s masterpieces, a business building in Racine, Wis. It has no windows and no doors except the entrance." Published in "Frank Lloyd Wright and the Johnson Wax Building" Lipman, 1986 page 99. Acquired from the archives of the Chicago Sun-Times. Size: Original silver gelatin 10 x 8 photo. Title: S.C. Johnson Headquarters 1939 (1936 - S.237). Description: Administration building, viewed from the east. The Great Workroom is on the left, Administration offices are on the upper level. The carport is to the right. A similar view is published in �Frank Lloyd Wright and the Johnson Wax Building� Lipman, p.99 (0798.10), and in Frank Lloyd Wright Monogram 1924-1936 V.5, Pfeiffer, p.251. Stamped on verso: "Johnson Wax Photo, Neg #3864, S. C. Johnson & Son Inc., Racine, Wisconsin." Description: Recreational Terrace viewed from the South. The Great Workroom is on right, the globe would be across the street to the left. 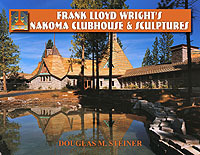 See Frank Lloyd Wright Monogram 1924-1936 V.5, Pfeiffer, p.246. Stamped on verso: "Johnson Wax Photo, Neg #3840, S. C. Johnson & Son Inc., Racine, Wisconsin." Description: Administration building, viewed from the Northwest. The West side of the Administration Building early evening. The Great Workroom is to the right, Administration offices are on the upper level. The carport is to the left. A similar view is published in �Frank Lloyd Wright and the Johnson Wax Building� Lipman, p.98. Stamped on verso: "Johnson Wax Photo, Neg #3993, S. C. Johnson & Son Inc., Racine, Wisconsin." Second copy, hand written on verso: "S. C. Johnson & Son, Inc." Stamped on verso: "Dec 19 1967." Two original 10 x 8 B&W photograph. Size: Two original 10 x 8 B&W photograph. Description: �Detail of The Great Workroom�. Note double-wing tub desks. Photographer unknown #90018-F. S. C. Johnson & Son Inc. Racine, Wisconsin. 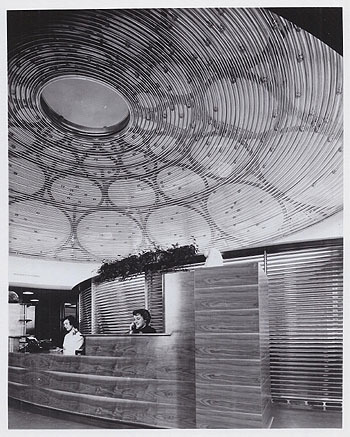 Similar image published in �Frank Lloyd Wright and the Johnson Wax Building� Lipman, 1986 page 107. Size: Original silver gelatin photo. Description: Administration building Penthouse, Herbert Johnson�s office on the right. 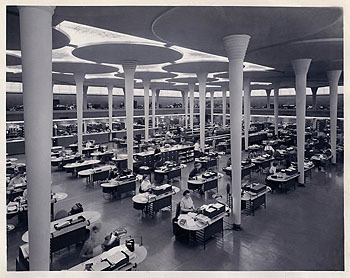 A similar view is published in �Frank Lloyd Wright and the Johnson Wax Building� Lipman, p.113. Stamped on verso: "15346." Title: S.C. Johnson Headquarters Circa 1939 (1936 - S.237). Description: Designed by Frank Lloyd Wright in 1936. Administration building Penthouse. View of Herbert Johnson�s office, and most likely Herbert Johnson. Clipping pasted to verso: "Offices almost entirely of glass are used by the wax firm's executives." Hand Written on verso: "April 30 / 39. Page 5. Racine, Wis. Johnson Wax Co."
Title: SC Johnson Headquarters �Private Penthouse Office�. Description: The desk engages the built-in cabinet. Photographer unknown. �Photographic Department Neg. #3871 S. C. Johnson & Son Inc. Racine, Wisconsin.� Published in �Frank Lloyd Wright and the Johnson Wax Building� Lipman 1986, page 115. Size: Original 8 x 10 silver gelatin photo. Title: S.C. Johnson Headquarters "Secretaries� Office" 1939 (1936 - S.237). Description: Furniture was designed by Frank Lloyd Wright in 1936. Left: three legged arm chair with wheels; Center: desk; Right: three legged arm chair. 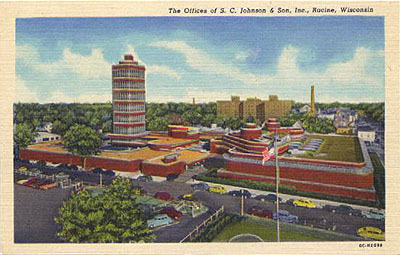 The S.C. Johnson headquarters was designed in 1936, completed on April 22, 1939. Label taped to verso: "Believe it or not, Some secretaries get privacy. 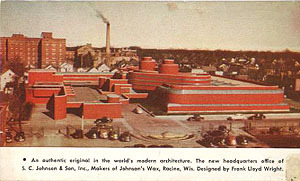 Frank Lloyd Wright, whose concern over the American way of life has resulted in so many basic changes in building, has finally got around to considering the plight of the secretary and in the recently completed S.C. Johnson & Sons plant at Racine, Wisconsin, saw to it that she would get privacy, in fact as well as name, through the development of such unit offices as the one illustrated here. During the next week, an architect�s model of this famous building will be exhibited in Chicago through the Office Equipment Display at the Palmer House." Stamped on verso: "From Photographic Department, S.C. Johnson & Son Inc. Racine, Wis. Makers of Johnson�s Wax. A-192." Published in "The Prairie School Tradition" Spencer, 1985 page 103. Size: Original silver gelatin 8 x 10 B&W photo. Title: S.C. Johnson Headquarters Theater 1939 (1936 - S.237). Description: Administration building Theater, Mezzanine level. "Figure 108. 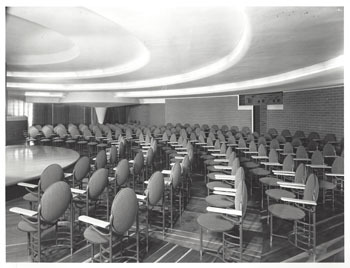 Theater, mezzanine level, 1939. 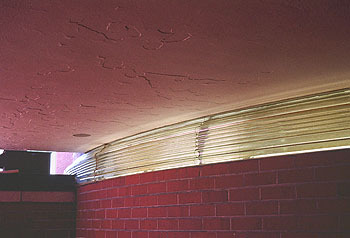 The ceiling is composed of stepped semicircles. A projection booth can be seen at right. Not visible in photograph our sliding panels located behind rostrum that separate the theater from the lobby and provide a projection screen." 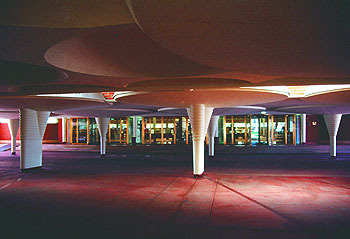 Published in Frank Lloyd Wright and the Johnson Wax Building, Lipman, p.111. Stamped on verso: "Filed Dec 19 1967." Title: Taliesin, Spring Green, 1940 (1925 - S.218). 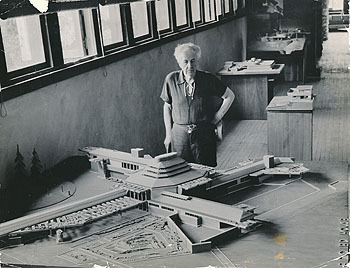 Description: Frank Lloyd Wright looks over the model of Wingspread, the home for Herbert Johnson, in the Hillside Drafting Studio, Taliesin. 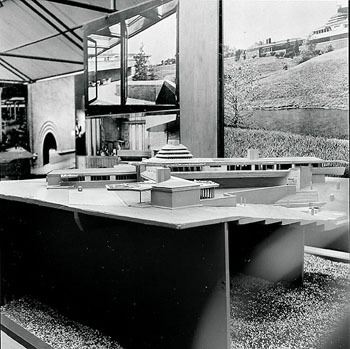 The model was first shown at The Museum of Modern Art, November 1940, "In the Nature of Materials, The Work of Frank Lloyd Wright." In the background are Suntop Homes, S.C. Johnson Administration Building, and in the background, the Jester House. Published in "The Show To End All Shows," Reed and Kasizen, 2004, p.39. Also published in "Wright on Exhibit," Smith, 2017, page x. Hand written on verso: "Frank Lloyd Wright at Taliesin." Stamped on verso: "Aug 4 1941." Size: Original 11 x 8.5 B&W photograph. Title: Herbert F. Johnson Residence, Wingspread (1937 - S.239), Circa 1940. 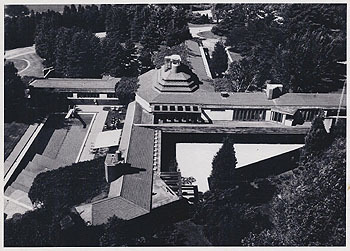 Description: During construction of the SC Johnson & Son Administration Building (1936 - S.237), H.F. Johnson commissioned Frank Lloyd Wright to design his expansive home in Wind Point, Wisconsin. This model of Wingspread was constructed during the summer of 1940, by the Taliesin apprentices for the exhibition "Frank Lloyd Wright: American Architect" held at The Museum of Modern Art (MOMA), November 12, 1940 - January 5, 1941. See "The Show to End all Shows", 2004. Size: Original 11 x 14 B&W photograph. Title: S.C. Johnson Headquarters Circa 1940 (1936 - S.237). Description: 1) Ground and floor plan for the entrance and Great Workroom. Label on sleeve: "Arch. USA Wright, F.L. Johnson Wax Admin. Bldg. Racine, Wisc. 1936-7." . Size: Original 35mm Color slide enclosed in glass and 5 x 8 high res digital image. Description: 2) View of the entrance to the Great Workroom looking out to the drive and parking area. Label on sleeve: "Arch. USA Wright, F.L. Johnson Wax Admin. Bldg. Racine, Wisc. 1936-7." Size: Original 35mm Color slide encased in glass and 5 x 8 high res digital image. 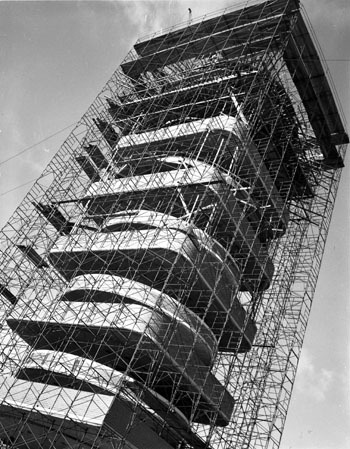 Title: S.C. Johnson Research Tower under construction June1949. (1944 - S.238). Description: View of the Tower under construction. 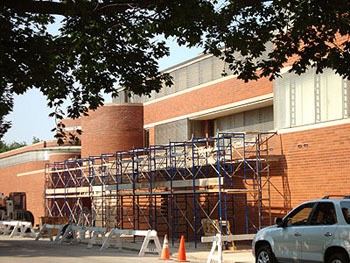 Scaffolding is in place. Windows have not been installed, enhancing the view of cantilevered floors. Once completed, square floors are exposed, round floors are somewhat visible through tubular glass. The Research Tower was designed in 1944, construction began in 1947 and the opening ceremony was held on November 17, 1950. Published in "Frank Lloyd Wright and the Johnson Wax Buidlings" Lipman, 1986, page 144. Size: 8 x 10 B&W photograph. 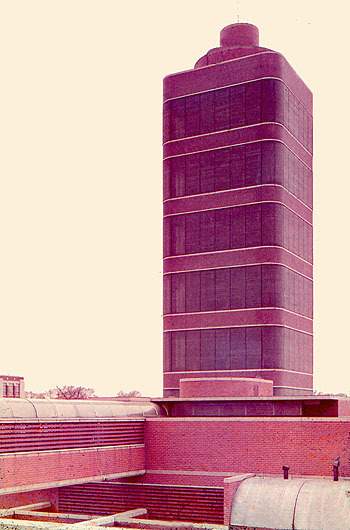 Title: SC Johnson Research Tower, 1950. Description: Round Mezzanines are visible through the glass tubing. The Research Tower was designed in 1944, construction began in 1947 and the opening ceremony was held on November 17, 1950. Published in "A Testament" Wright,1957, page 172-173. "Frank Lloyd Wright, His Life, His Work, His Words" Wright, 1966, page 133. �Frank Lloyd Wright and the Johnson Wax Building� Lipman, 1986, page 158 (dates image at 1950). Size: Original silver gelatin photo. 8 x 10. 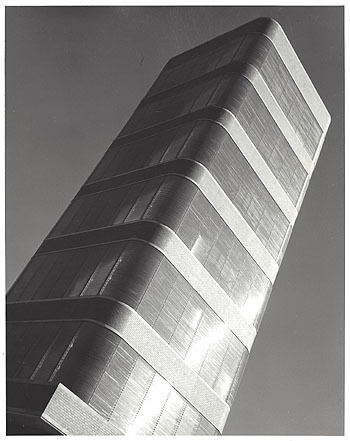 Title: S.C. Johnson Research Tower (1944 - S.238), circa 1950. 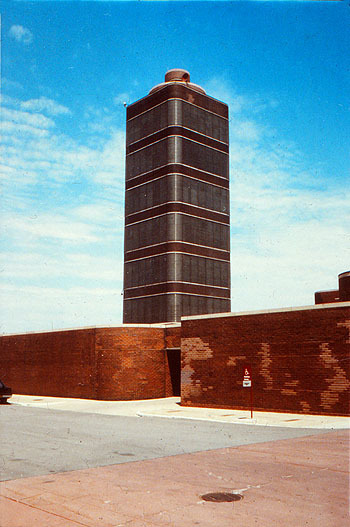 Description: Designed by Frank Lloyd Wright in 1944, the tower opened in November 1950. The tower was designed with a center core the was 54 feet deep. Fifteen floors cantilevered out from the core, floors alternated square and round, reaching a height of 153 feet. Stamped on verso: "Johnson Wax Photo, Neg #14260, S. C. Johnson & Son Inc., Racine, Wisconsin." 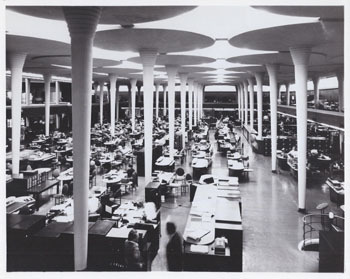 Title: S.C. Johnson Headquarters Circa 1950 (1936 - S.237 and 1944 - S.238). Description: 1) View of the Great Workroom. Label on sleeve: "Arch. USA Wright, F.L. Johnson Wax & Res. Cen. Ad. Bldg. Wkr. 1936-39. Tower 1948-50. Racine, Wisconsin." Description: 2) Exterior view of the Great Workroom. The Research Tower is to the left out of frame. 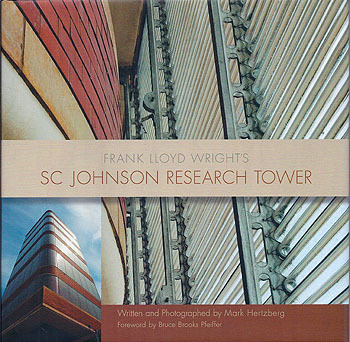 Label on sleeve: "F. L. Wright, Johnson Fac.."
Description: 3) View of the Research Tower. Label on sleeve: "Wright, Frank Lloyd. John Wax & Res. Cen. Lab., ext 1936-1939; Tower 1948-50. 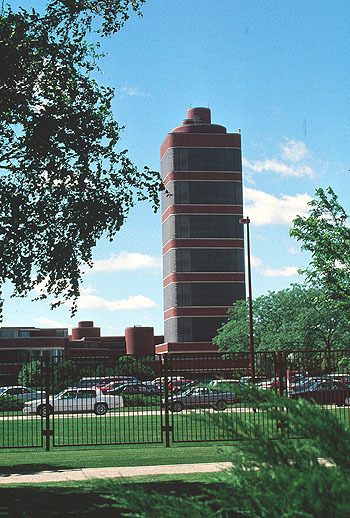 Racine, Wis."
Description: 4) View of the Research Tower. Label on sleeve: "Arch. 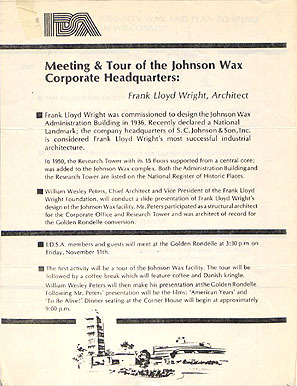 Johnson Wax Co. Racine, Wis. Lloyd Wright, Frank.". Description: 5) View of the Research Tower. Label on sleeve: "Arch. 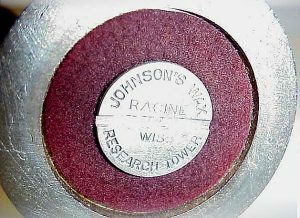 Johnson Wax Research Tower. Racine, Wis. 1949. Wright, Frank Lloyd." Description: 6) View of the Administration Building. The Great Workroom is on the left, the Research Tower is to the right. Label on sleeve: "Arch. S. C. Johnson & Son Administration Building. 1937-39.. Wright, Frank Lloyd." Title: S.C. Johnson Headquarters Circa 1951 (1936 - S.237). Description: Administration building Penthouse. 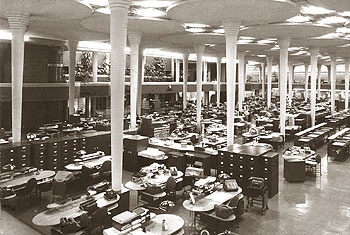 View of Herbert Johnson�s office. Possibly after the 1951 remodel. When comparing this view to the 1939 view, published in "Frank Lloyd Wright and the Johnson Wax Building," 1986, page 114, the outside wall in the background on the left has been raised about three feet. Also, setting on that wall is a portrait of Wright taken in 1950. Stamped on verso: "Dec 19 1967." 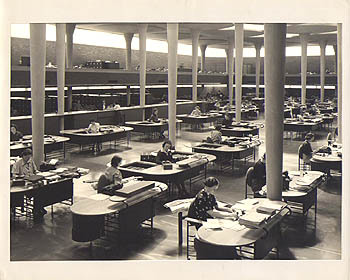 Title: SC Johnson Headquarters "Great Workroom" 1953. 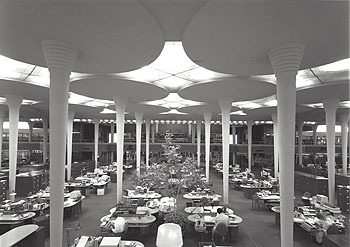 Description: Caption on verso: "Pillars arranged in a unique pattern developed by Wright provide open areas in the Johnson Wax Co.�s administration offices at Racine, Wis. Wright cites this building as proof that an architect can obtain spaciousness in a building without making it appear awkward." Stamped on verso: "Dec 27, 1953. International Newsreel Photo, 235 East 65th Street, New York 17, N.Y."
Size: Original silver gelatin 9 x 7 photo. Title: S.C. Johnson Headquarters Circa 1953. Description: Viewed from the West. According to SC Johnson, the globe in the foreground was installed in 1952. 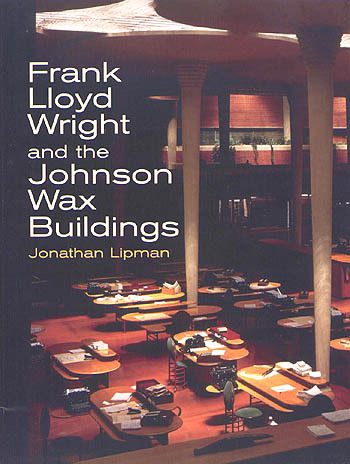 Johnathan Lipman dates it to 1954, "Frank Lloyd Wright and the Johnson Wax Building," 1986, page 130. The Research Tower and complex is on the left. 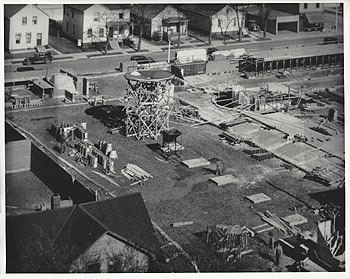 The opening Ceremony for the Research Tower was November 17, 1950. The Great Workroom is on the right. Stamped on verso: "S.C. Johnson & Son, Inc., Photographic Department, No. 10982-6." Description: Viewed from the Southeast. 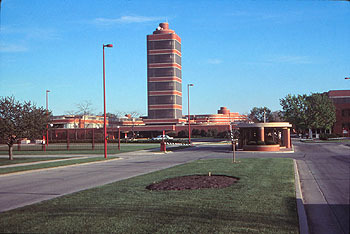 The Research Tower complex is in the foreground, the Tower is in the background, the porte cochere is on the left. Photographed before the addition of the second and third floors over the east wing of the Research Tower complex, added in 1961. The car to the far right is a 1952 Ford Crestline Victoria. Title: 4) #59: "Wingspread" Model, Herbert F. Johnson Residence (1937 - S.239). 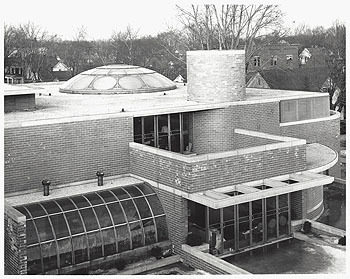 Description: During construction of the SC Johnson & Son Administration Building (1936 - S.237), H.F. Johnson commissioned Frank Lloyd Wright to design his expansive home in Wind Point, Wisconsin. This model of Wingspread was constructed during the summer of 1940, by the Taliesin apprentices for the exhibition "Frank Lloyd Wright: American Architect" held at The Museum of Modern Art (MOMA), November 12, 1940 - January 5, 1941. See "The Show to End all Shows", 2004. The 1940 caption: "The latest and largest of the �Prairie Houses�." Large color photograph of model published in "Frank Lloyd Wright / Sixty Years of Living Architecture" (Zurich), 1952, page 81-82. (Notice little boy in the background looking at model). 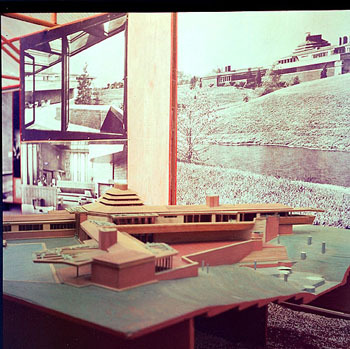 Title: Sixty Years of Living Architecture Exhibition, Los Angeles 1954 (Frank Lloyd Wright Foundation project #5427). Description: A traveling exhibition of Wright's work, consisting of models, photographs and original drawings. A Preview of the exhibition was held in Philadelphia (January 1951). The world wide tour opened in Palazzo Strozzi Florence, Italy (June 1951). In "Sixty Years" (New York), Wright notes that from Florence the Exhibition traveled to "Switzerland, France, German and Holland". The Exhibition catalogs are dated: Paris (April 1952), Zurich (End of May 1952), Munich (May 16 - June 15, 1952), and Rotterdam (dated June 1, 1952). After two years in Europe the exhibition crossed the Atlantic to Mexico City, then to New York (1953). After an exhibition in Los Angeles, June, 1954, the final exhibition took place in Chicago, October, 1956. The Los Angeles exhibition premiere was held at Barnsdall Park�s Municipal Art Center on June 1, 1954, then open to the public from June 2 to July 11, and was extended to July 25, 1954. A temporary pavilion, similar to the pavilion in New York, was attached to the line of kennels that reached from the house to the garage. Exhibition Model & Panel #59. " 'Wingspread,' Johnson House, Racine, Wisc., 1937. Model." Sixty Years of Living Architecture Exhibition, Los Angeles 1954. Model of 'Wingspread,' Herbert F. Johnson's House in Racine, Wisc. Three photographs of Wingspread in the background. Photographed by Loch Crane in June, 1954. Description: A traveling exhibition of Wright's work, consisting of models, photographs and original drawings. A Preview of the exhibition was held in Philadelphia (January 1951). The world wide tour opened in Palazzo Strozzi Florence, Italy (June 1951). In "Sixty Years" (New York), Wright notes that from Florence the Exhibition traveled to "Switzerland, France, German and Holland". The Exhibition catalogs are dated: Paris (April 1952), Zurich (End of May 1952), Munich (May 16 - June 15, 1952), and Rotterdam (dated June 1, 1952). After two years in Europe the exhibition crossed the Atlantic to Mexico City, then to New York (1953). After an exhibition in Los Angeles, June, 1954, the final exhibition took place in Chicago, October, 1956. The Los Angeles exhibition premiere was held at Barnsdall Park�s Municipal Art Center on June 1, 1954, then open to the public from June 2 to July 11, and was extended to July 25, 1954. A temporary pavilion, similar to the pavilion in New York, was attached to the line of kennels that reached from the house to the garage. Exhibition Model & Panel #59. " 'Wingspread,' Johnson House, Racine, Wisc., 1937. Model." Sixty Years of Living Architecture Exhibition, Los Angeles 1954. Model of 'Wingspread,' Herbert F. Johnson's House in Racine, Wisc. Three photographs of Wingspread in the background. Far Left: Exhibition Panel #98. "Shop for V. C. Morris, San Francisco, Cal., 1948." Photographed by Loch Crane in June, 1954. Description: A traveling exhibition of Wright's work, consisting of models, photographs and original drawings. A Preview of the exhibition was held in Philadelphia (January 1951). The world wide tour opened in Palazzo Strozzi Florence, Italy (June 1951). In "Sixty Years" (New York), Wright notes that from Florence the Exhibition traveled to "Switzerland, France, German and Holland". The Exhibition catalogs are dated: Paris (April 1952), Zurich (End of May 1952), Munich (May 16 - June 15, 1952), and Rotterdam (dated June 1, 1952). After two years in Europe the exhibition crossed the Atlantic to Mexico City, then to New York (1953). After an exhibition in Los Angeles, June, 1954, the final exhibition took place in Chicago, October, 1956. The Los Angeles exhibition premiere was held at Barnsdall Park�s Municipal Art Center on June 1, 1954, then open to the public from June 2 to July 11, and was extended to July 25, 1954. A temporary pavilion, similar to the pavilion in New York, was attached to the line of kennels that reached from the house to the garage. Exhibition Panel #92. 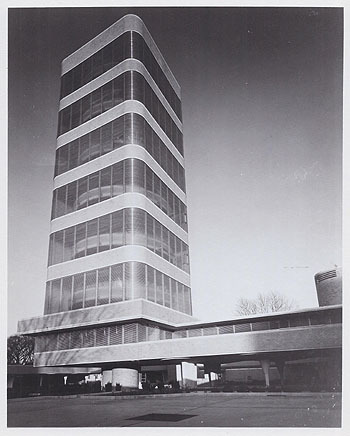 "Johnson Laboratory Tower, Racine, Wisc., 1947" Sixty Years of Living Architecture Exhibition, Los Angeles 1954. 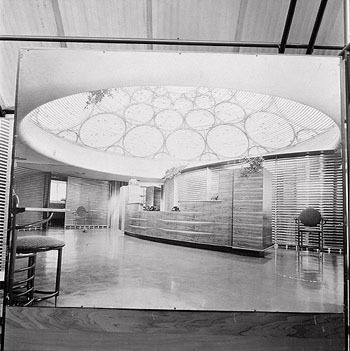 SC Johnson Advertising Department Reception Room (1944 - S.238) 1950. The Advertising Department is in the Southeast corner of the Research Tower complex. Designed in 1944, the tower complex opened in November 1950. 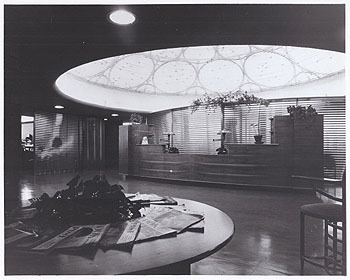 The dome above the reception room is similar to one of the designs first proposed for the Guggenheim Museum. Photographed by Loch Crane in June, 1954. Title: SC Johnson Headquarters "Great Workroom" 1956. Description: Stamped on verso: "From Photographic Department, S.C. Johnson & Sons, Inc., Racine, Wis. Makers of Johnson�s Wax. Aug 8, 1956." Acquired from the archives of the Chicago Sun-Times. Title: S.C. Johnson Administration Building (1936 - S.237) and Tower (1944 - S.238), circa 1956. Description: Viewed from the West, the Research Tower is on the left, Administration building on the right. Designed by Frank Lloyd Wright in 1944, the tower opened in November 1950. The tower was designed with a center core the was 54 feet deep. Fifteen floors cantilevered out from the core, floors alternated square and round, reaching a height of 153 feet. 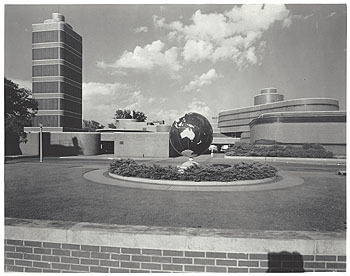 According to SC Johnson, the globe in the foreground was installed in 1952. Johnathan Lipman dates it to 1954. 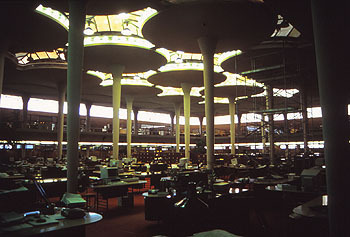 A similar view is published in Frank Lloyd Wright and the Johnson Wax Building Lipman, p.130. Stamped on verso: "11545." Title: S.C. Johnson Headquarters Circa 1958. Description: Viewed from the West. 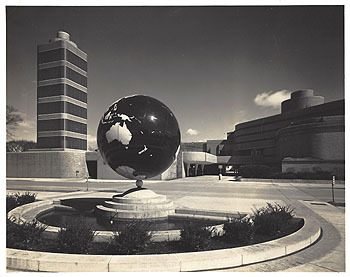 According to SC Johnson, the globe in the foreground was installed in 1952. Johnathan Lipman dates it to 1954, "Frank Lloyd Wright and the Johnson Wax Building," 1986, page 130, which is a similar view, minor changes. The Research Tower and complex is on the left. The opening Ceremony for the Research Tower was November 17, 1950. The Great Workroom is on the right. Stamped on verso: "S.C. Johnson & Son, Inc., Photographic Department, No. 11009 297." Title: Herbert F. Johnson Residence, Wingspread 1960 (1937 - S.239). Description: View of the Living Room from the mezzanine. Hand written on verso: "The Johnson Foundation has opened Wingspread the Frank Lloyd Wright designed home, which will be used as the foundation administrative headquarters and conference center. (SC Johnson and Son Corp.)." Clipping pasted to verso: "The building is designed around a central room. A view from the mezzanine shows just a section of the room. The spiral stair at right leads to an observation tower." Stamped on clipping: "Nov 11 1960." Acquired from the archives of the Milwaukee Sentinel. Title: Herbert F. Johnson Wingspread (1937 - S.239) 1960. Description: Clipping pasted to verso: "Racine, Wis. - Aerial view shows advanced design of Wingspread, huge �prairie house� designed by the late Frank Lloyd Wright and built near Racine in 1938. Its opening as a conference center was announced by the Johnson Foundation, with the first parley there to be a meeting of the Midwest Regional American assembly Nov. 17-20. Authorities on foreign relations will discuss who should be next secretary of state. Home formerly was residence of H. F. Johnson, board chairman of S. C. Johnson & Sons, Inc., wax manufacturers", stamped "Nov 12, 1960". Published in "The Johnson Foundation, Wingspread" 1961. Acquired from the archives of the Chicago Tribune. Size: Original 10 x 6.9 B&W photograph. Description: View of the home from the South. 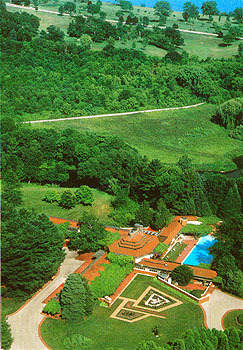 The swimming pool is on the right in the foreground, the center of the home with the tower is in the background. 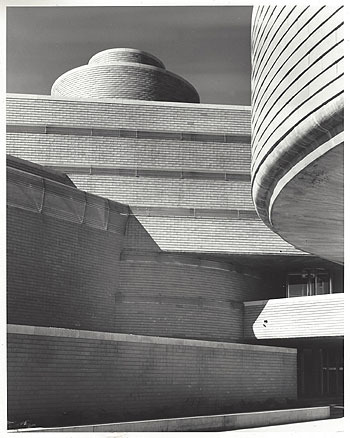 Caption pasted to verso: "An exterior view of Wingspread, above, shows clerestory roof of Frank Lloyd Wright designed building with glass observation tower dominating the domed central portion of the structure. The building at Wind Point, North of Racine, Wisconsin, will serve as a conference center and as administrative headquarters for the Johnson Foundation." Stamped on verso: "From the photographic dept. S. C. Johnson & Son, Inc. Negative No. 18758-6." "Reference Dec 2 60, N. E. A." Herbert F. Johnson (1899 - 1978) donated their home, Wingspread, to The Johnson Family Foundation in 1959 as an international educational conference facility. 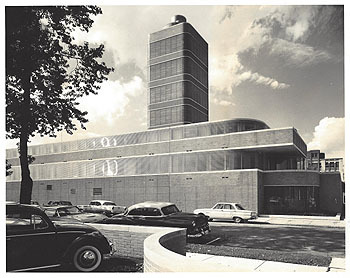 Title: S.C. Johnson Headquarters Circa 1962. Description: Two views from the Northeast. The Research Tower complex is in the foreground, the Tower is in the background. 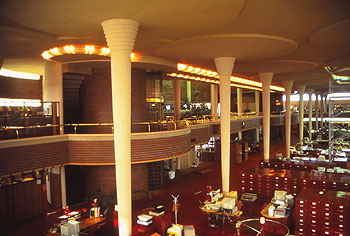 Similar view in "Frank Lloyd Wright and the Johnson Wax Building," Lipman, 1986, page 172. 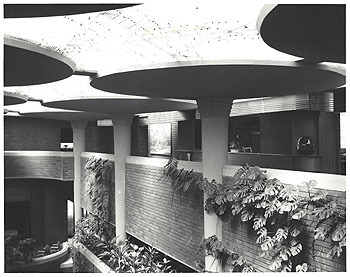 The second and third floor addition over the east wing of the Research Tower courtyard was designed by Taliesin Associated Architects in 1961. 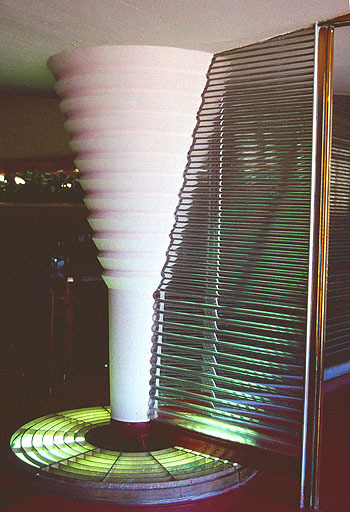 SC Johnson substituted Pyrex tubing for Plexiglas sheeting. The car to the right appears to be a 1960 Ford Falcon. There is a 1961 Thunderbird just past the VW in the foreground. Clouds vary in the two originals. Size: Two original 10 x 8 B&W photographs. 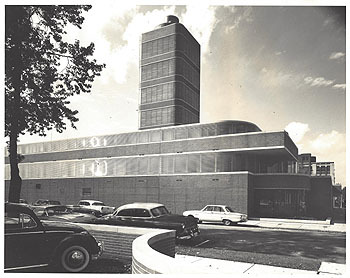 Title: S.C. Johnson Headquarters Circa 1962 (1936 - S.237). Description: View of the inner courtyard from the Northwest. The Research Tower is just to the right. From the automobiles in the photographs dates circa 1962. Label pasted to face: "University of California, Berkeley. 20th Century - United States. 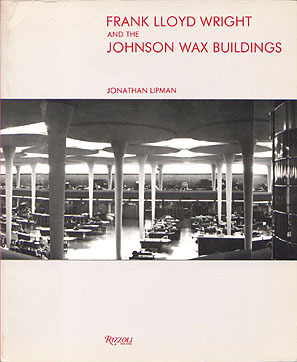 Wright, F.L.. Johnson�s Wax Bldg. 1936-9. Racine, Wisconsin. Parking area. Neg.19256-3. Department of Architecture." Acquired from the archives of the University of California, Berkeley. Mounted to 14 x 11 gray board. Size: Original 9 x 7 B&W photograph. Title: S.C. Johnson & Son Administration Building 1964 (1936 - S.237). Description: View of the Lobby from the West. Monolithic dendriform columns have a diameter of 9 inches at the base and gradually widen to 2 feet 10 inches at the top, then spread out to a diameter of 18 feet 6 inches. The tallest columns are in the lobby at 31 feet tall, and the great room which are 21 feet 7.5 inches high. "Frank Lloyd Wright and the Johnson Wax Buildings," Lipman, 1986, p.50. 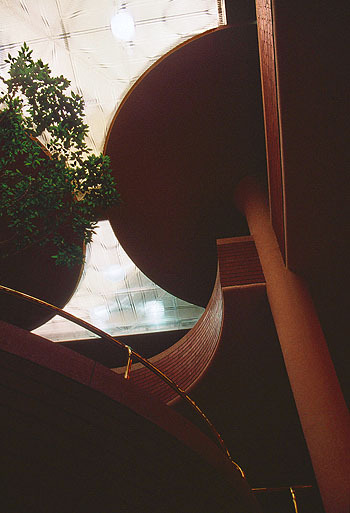 Clipping pasted to verso: "The rhythmic geometry of Frank Lloyd Wright's architecture is dramatically demonstrated in the reception area of the administration building. The curved balconies are part of the mezzanine and penthouse office areas." Stamped on clipping: "Dec 13 1964." 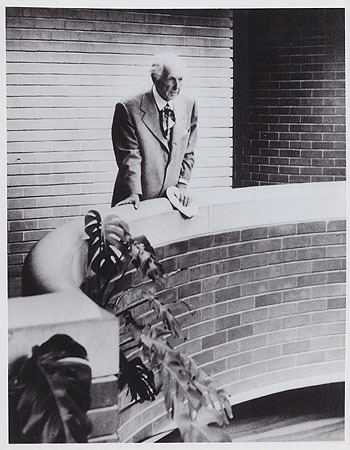 Earlier image in "Frank Lloyd Wright and the Johnson Wax Building", Lipman, 1986, p.101. Description: View of the spiral stairway in the Great Workroom. Stairway leads to women�s lounge. Designed in 1936, the official opening of the SC Johnson Administration Building spanned three days, April 22-24, 1939. Ken Burns considered the Johnson Wax Headquarters Great Workroom as "the greatest room in the United States today." Architects have called it the greatest contribution to business housing since the advent of the skyscraper. It is built without windows and doors (other than the main opening) and is heated through the floor and supported by �golf-tee� columns, modeled on the structure of a flower." Clipping pasted to verso: "Lighted, winding stair wells, like this one, provide access to women's lounges. 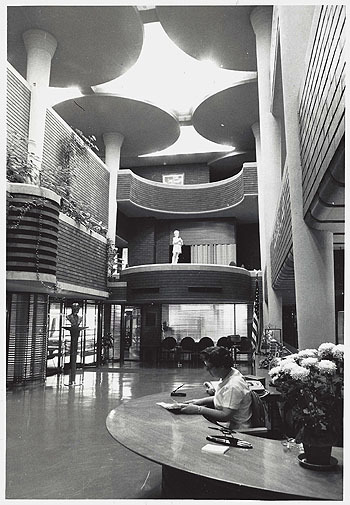 The building's architect, Frank Lloyd Wright, also designed the desks and other furnishings in the building. S. C. Johnson & Son, Inc." Stamped on clipping: "Dec 13 1964." Title: S.C. Johnson & Son Administration Building Penthouse 1964 (1936 - S.237). Description: View of Administration building Penthouse. Herbert Johnson�s office on the right. Monolithic dendriform columns have a metal base embedded in the floor. Golf tee in shape, the base has a diameter of 9 inches, gradually widening to 2 feet 10 inches at the top, then spreading out to a diameter of 18 feet 6 inches. The tallest columns are in the lobby at 31 feet tall. Clipping pasted to verso: "Tapered columns rise the full three levels of the 25 year old administration building of S. C. Johnson & Son, Inc., Racine. The lobby and mezzanine or partly visible from the top level executive offices shown above." Stamped on clipping: "Dec 13 1964." Stamped on verso: "650457." A similar view is published in "Frank Lloyd Wright and the Johnson Wax Buildings" Lipman, p.113. Description: Aerial view. 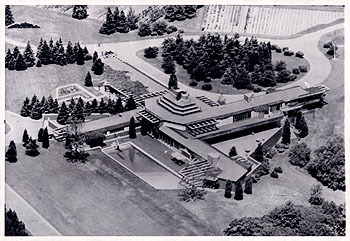 Clipping pasted to verso: "Wingspread, Frank Lloyd Wright designed conference center of The Johnson Foundation, where the Planning Conference for the International Convocation based on Pope John Twenty-Third�s Encyclical, Peace on Earth, will take place May 17-19, 1964." Title: S.C. Johnson Golden Rondelle Theater 1965. Description: The Golden Rondelle Theater was originally designed by Lippincott and Margulies as the SC Johnson Pavilion for the New York World�s Fair in 1964-65. After the Worlds Fair the Golden Rondelle was dismantled and reassembled on the SC Johnson campus. 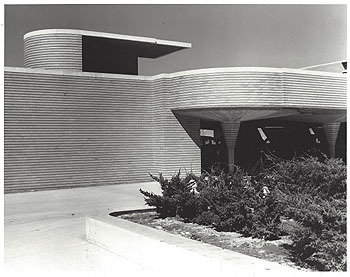 It was then re-designed in 1967 by Taliesin Associated Architects as a permanent structure for the SC Johnson campus where it continues to function as a theater for both company and public events. Stamped on verso: "Johnson Wax Photo. Neg. #21272-86. S. C. Johnson & Son Inc., Racine, Wisconsin." Stamped on clipping pasted to verso: "Jan 14 1966." 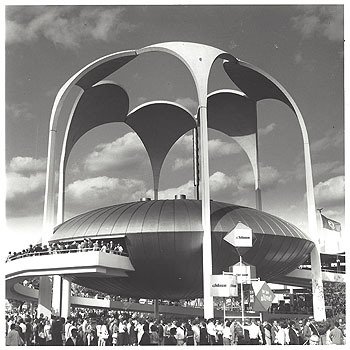 Hand Written on verso: "The Johnson Wax Golden Rondelle Theater, a landmark at the New York World Fair with its six 90 foot petal top columns will be reconstructed in Racine in the Spring minus the column. It will be flanked by auxiliary buildings designed by Taliesin Associates, Inc. to blend with administration and research center of the (S.C. Johnson & Son, Inc.), a block to the south, designed by the late Frank Lloyd Wright." Title: S.C. Johnson Golden Rondelle Theater 1966. Description: The Golden Rondelle Theater was originally designed by Lippincott and Margulies as the SC Johnson Pavilion for the New York World�s Fair in 1964-65. After the Worlds Fair the Golden Rondelle was dismantled and reassembled on the SC Johnson campus. 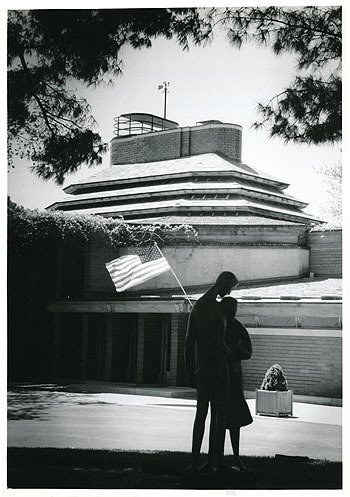 It was then re-designed in 1967 by Taliesin Associated Architects as a permanent structure for the SC Johnson campus where it continues to function as a theater for both company and public events. Size: 7.5 x 6 B&W photograph. Title: S.C. Johnson Golden Rondelle Theater 1967. Description: Viewed from the North, the Research Tower is in the background. 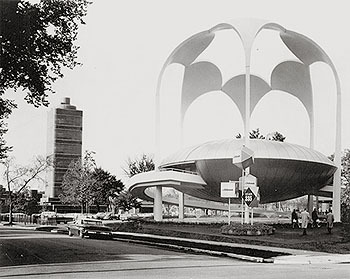 The Golden Rondelle Theater was originally designed by Lippincott and Margulies as the SC Johnson Pavilion for the New York World�s Fair in 1964-65. After the Worlds Fair the Golden Rondelle was dismantled and reassembled on the SC Johnson campus. 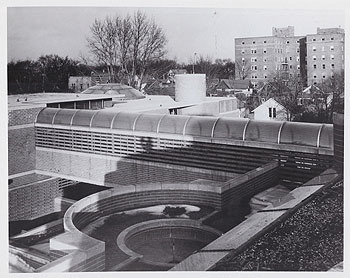 It was then re-designed in 1967 by Taliesin Associated Architects as a permanent structure for the SC Johnson campus where it continues to function as a theater for both company and public events. Clipping pasted to verso: "The new Johnson Wax Golden Rondelle theater at Racine will be dedicated Thursday. Stamped on clipping: "Jul 22 1967." Size: Original 10 x 6.5 B&W photograph. Title: S.C. Johnson & Son Administration Greenhouse, Exhibition Dwelling and Advertising Department 1967 (1944 - S.238). Description: On the second floor, the Greenhouse is on the left, the Exhibition Dwelling is to the right. In the foreground, out of view is the Formal garden over the Research Tower carport. 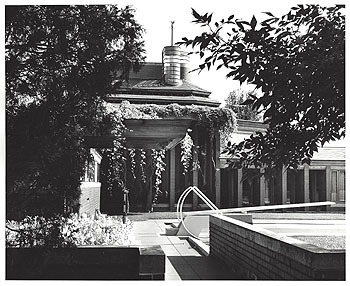 Caption, "Frank Lloyd Wright and the Johnson Wax Buildings," Lipman, 1986, page 172, figure 150: "Wright designed this small formal garden with a stone surface and a shallow pool. 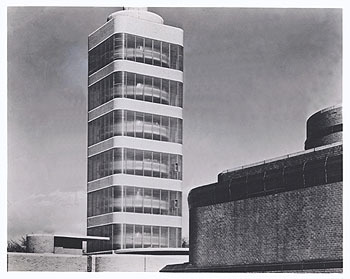 A greenhouse is at the left and the advertising department is located above the exhibition dwelling." The Advertising department is on the third floor. 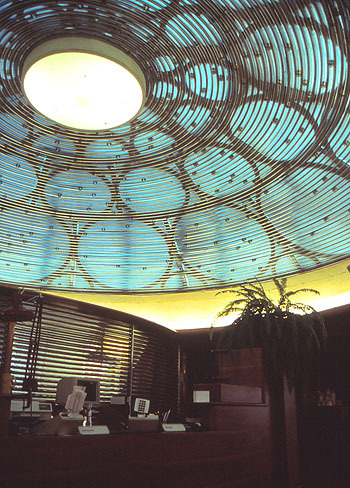 The ornate dome of glass tubing is above the reception area. Stamped on verso: "Dec 19 1967." 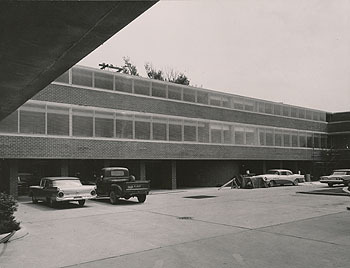 Title: S.C. Johnson & Son Administration Building 1967 (1944 - S.238). Description: View of the West side of the Administration Building 1939 from the Northeast. Exterior of the great workroom. Designed in 1936, the official opening of the SC Johnson Administration Building spanned three days, April 22-24, 1939. It has been called the greatest contribution to business housing since the design of the skyscraper. Stamped on verso: "Neg 3838." "Dec 19 1967." Title: S.C. Johnson & Son Administration Pilot Laboratory 1967 (1944 - S.238). Description: The Research Tower and the addition surrounding it was designed by Frank Lloyd Wright in 1944, construction began in 1947 and the opening ceremony was held on November 17, 1950. The Pilot Laboratory is in the Southwest corner of the ground floor of the new section. 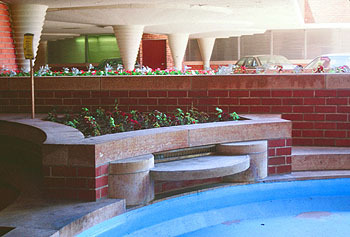 Additional view is published in Frank Lloyd Wright and the Johnson Wax Buildings, Lipman, 1986, p.168. Stamped on verso: "Dec 19 1967." SC Johnson Administration Building (1936 - S.237) and Tower (1944 - S.238). Set A: The World�s Most Modern Office Building. 10-photo portfolio accompanied by a six-page typewritten narrative, describing major innovations, 43 miles of glass, the dendriform columns, modern furniture, features and highlights. The portfolio was purchased from a New York City architect who was associated with the project in the 1930's. (Note: Google Books dates this circa 1971.) Set B: Second set of 10 photographs matching the 1971 portfolio. 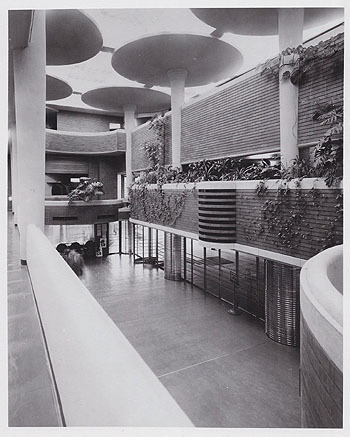 Photographs were originally obtained in the 1970's as a Johnson building tour memento. The quality of this second set is of a higher quality. Image #7 is a slightly different view of the great workroom. Ten original 8x10 B&W photographs mounted to gray poster board. 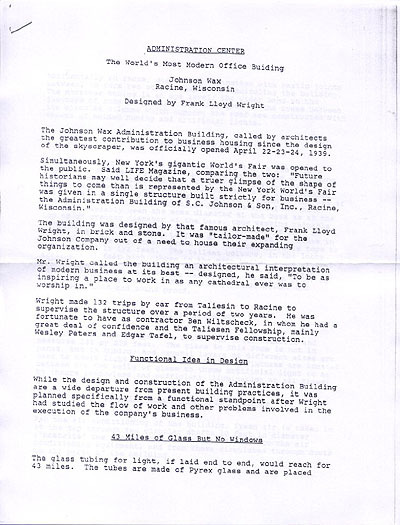 Description: "The Johnson�s Wax Administration Building, called by architects the greatest contribution to business housing since the design of the skyscraper, was officially opened April 22-23-24, 1939..." A six-page typewritten narrative, describing major innovations, 43 miles of glass, the dendriform columns, the Great Workroom, Cherokee red brick walls, modern furniture, features and highlights. P. 6. Title: #1 A&B) SC Johnson Administration Building Great Room (1936 - S.237). Description: West side of Administration Building 1939, viewed from the Northeast. Exterior of the great workroom. Designed in 1936, the official opening of the SC Johnson Administration Building spanned three days, April 22-24, 1939. It has been called the greatest contribution to business housing since the design of the skyscraper. 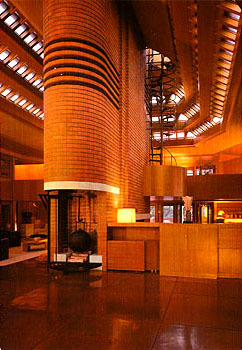 Similar image in "Frank Lloyd Wright and the Johnson Wax Building", Lipman, 1986, p.98. Title: #2 A&B) SC Johnson Administration Building Lobby (1936 - S.237) 1939, viewed from the East, second level. Description: Designed in 1936, the official opening of the SC Johnson Administration Building spanned three days, April 22-24, 1939. It has been called the greatest contribution to business housing since the design of the skyscraper. Monolithic dendriform columns had a metal base embedded in the floor. Golf tee in shape, the base has a diameter of 9 inches, gradually widen to 2 feet 10 inches at the top, then spread out to a diameter of 18 feet 6 inches. The tallest columns are in the lobby at 31 feet tall, and the great room which are 21 feet 7.5 inches high. 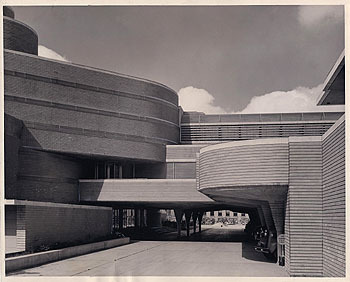 Published in "Frank Lloyd Wright and the Johnson Wax Building", Lipman, 1986, p.50. Title: #3 A&B) SC Johnson Administration Building detail of the Lobby (1936 - S.237) 1939, viewed from the ground level. Description: Designed in 1936, the official opening of the SC Johnson Administration Building spanned three days, April 22-24, 1939. It has been called the greatest contribution to business housing since the design of the skyscraper. Monolithic dendriform columns had a metal base embedded in the floor. Golf tee in shape, the base has a diameter of 9 inches, gradually widen to 2 feet 10 inches at the top, then spread out to a diameter of 18 feet 6 inches. The tallest columns are in the lobby at 31 feet tall, and the great room which are 21 feet 7.5 inches high. 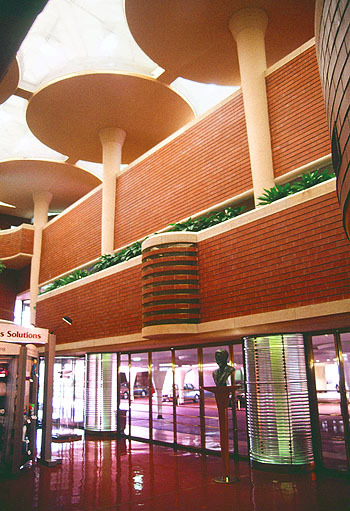 Similar image in "Frank Lloyd Wright and the Johnson Wax Building", Lipman, 1986, p.113. Title: #4 A&B) SC Johnson Research Tower (1944 - S.238) 1950, viewed from the Northwest, inside the courtyard. Description: Designed in 1944, the tower opened in November 1950. The tower was designed with a center core the was 54 feet deep. Fifteen floors cantilevered out from the core, floors alternated square and round, reaching a height of 153 feet. 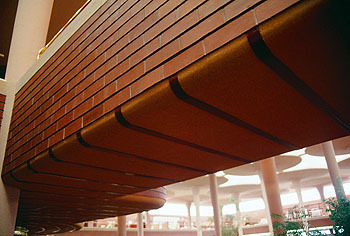 Similar image in "Frank Lloyd Wright and the Johnson Wax Building", Lipman, 1986, p.155, dated 1950. Title: #5 A&B) SC Johnson Research Tower complex (1944 - S.238) 1950, viewed from the Southwest, across the rooftop of the new Research Tower complex. Description: The Research Tower is to the left out of the picture. The flora pond is in the foreground. The walkway bridge extends from the original Administration Building to the new complex that also included the advertising department. The glass done covers the lobby of the reception area of the advertising department. Title: #6 A&B) Frank Lloyd Wright visits SC Johnson Administration Building (1936 - S.237), overlooks Lobby from third floor balcony 1950. Description: When the research tower complex was dedication on November 17, 1950, Mr. Wright was in attendance. Published in "Frank Lloyd Wright and the Johnson Wax Building", Lipman, 1986, p.ii. Title: #7A) SC Johnson Administration Building Great Room (1936 - S.237) Circa 1950. Description: Designed in 1936, the official opening of the SC Johnson Administration Building spanned three days, April 22-24, 1939. It has been called the greatest contribution to business housing since the design of the skyscraper. Monolithic dendriform columns had a metal base embedded in the floor. Golf tee in shape, the base has a diameter of 9 inches, gradually widen to 2 feet 10 inches at the top, then spread out to a diameter of 18 feet 6 inches. The tallest columns are in the lobby at 31 feet tall, and the great room which are 21 feet 7.5 inches high. Title: #7B) SC Johnson Administration Building Great Room (1936 - S.237) Circa 1950. Title: #8 A&B) SC Johnson Advertising Department Reception Room (1944 - S.238) 1950. Description: The Advertising Department is in the Southeast corner of the Research Tower complex. Designed in 1944, the tower complex opened in November 1950. The dome above the reception room is similar to one of the designed first proposed for the Guggenheim Museum (0987.35). Also see "The Solomon Guggenheim Museum", Pfeiffer, 1994, cover. Title: #9 A&B) SC Johnson Advertising Department Reception Room (1944 - S.238) 1950. Title: #10 A&B) SC Johnson Administration Building (1944 - S.238) aerial view circa 1970. Description: Aerial view in "Frank Lloyd Wright and the Johnson Wax Building", Lipman, 1986, p.162-3, is dated 1961. Parking lot in foreground was filled with homes in 1961. Building just to the right of the tower in 1961 has also been torn down and paved. Title: Herbert F. Johnson Residence, Wingspread Circa 1975 (1937 - S.239). Description: View of the Main Entrance. The North wing is on the left. 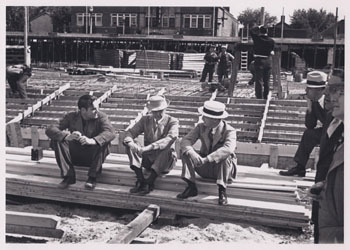 During construction of the SC Johnson & Son Administration Building (1936 - S.237), H.F. Johnson commissioned Frank Lloyd Wright to design his home in Wind Point, Wisconsin. Label on sleeve: "Frank Lloyd Wright (1869-1959). Herbert F. Johnson House (Wingspread) 1937. Main Entrance and North Wing to left. American Architecture." Size: Original glass 35mm color slide and 10 x 8 high res digital image. 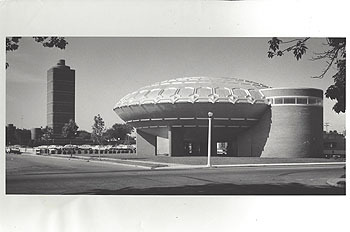 Title: S.C. Johnson & Son Administration Building Circa 1975 (1936 - S.237). Description: 1) West side of Administration Building, viewed from the Northeast. Exterior of the great workroom. Designed in 1936, the official opening of the SC Johnson Administration Building spanned three days, April 22-24, 1939. The Great Workroom is to the right, Administration offices are on the upper level. The carport is to the left. Label on sleeve: "Frank Lloyd Wright (1867-1959). 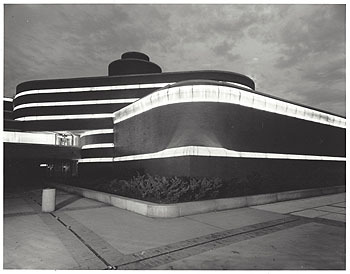 Johnson Wax Building, Racine WI, 1936-1939, Exterior. American Architecture." Title: 2) S.C. Johnson & Son Administration Building Circa 1975 (1936 - S.237). Description: View toward the main entrance of the Great Workroom. The carport is to the left. The Great Workroom is to the right, Administration offices are on the upper level. Label on sleeve: "Frank Lloyd Wright (1867-1959). 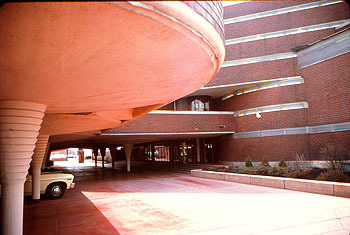 Johnson Wax Building 1936-1939, Parking Under & Entrance to Plant. Am. Arch." 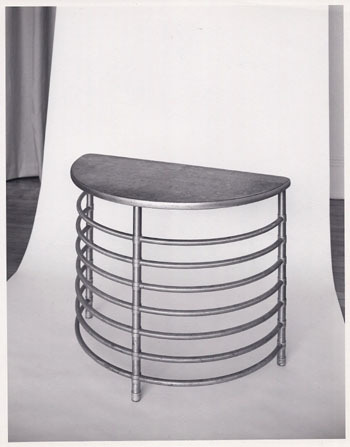 Title: SC Johnson Administration Building Table (1936 - S.237) 1981. 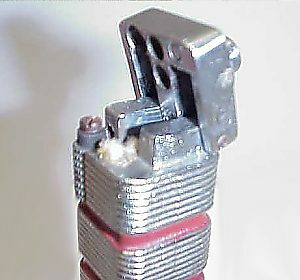 Description: Written on verso: "Johnson Wax Warren McArthur Prototype". Prototype table designed by Frank Lloyd Wright in 1936, three-quarter view. Warren McArthur Jr., son of one of Wright earliest clients (1892 - S.011), held patents on designs for hollow metal frame elements. He was the brother of Albert McArthur who was once an associate of Wright in Oak Park and designer of the Biltmore Hotel in Phoenix. Warren McArthur Co., New York, manufactured the prototypes. Steelcase Company, Grand Rapids, Michigan, went on to manufacture the furniture. Tubular Aluminum, wood veneer top. 23 (H) x 31 (W) x 15.25 (D). Photographed by Thomas Heinz. Acquired from Kelmscott Galleries. Size: Two original 8 x 10 B&W photographs. 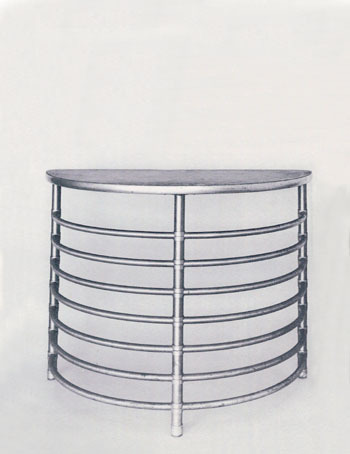 Description: Prototype table designed by Frank Lloyd Wright in 1936, straight view. Warren McArthur Jr., son of one of Wright earliest clients (1892 - S.011), held patents on designs for hollow metal frame elements. He was the brother of Albert McArthur who was once an associate of Wright in Oak Park and designer of the Biltmore Hotel in Phoenix. Warren McArthur Co., New York, manufactured the prototypes. Steelcase Company, Grand Rapids, Michigan, went on to manufacture the furniture. Tubular Aluminum, wood veneer top. 23 (H) x 31 (W) x 15.25 (D). 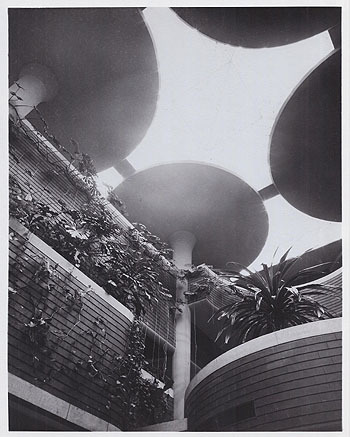 This photograph was published in "Frank Lloyd Wright", Kelmscott Galleries, 1981, page 44. Photographed by Quiriconi-Tropea Photographers. Acquired from Kelmscott Galleries. Size: 8 x 10 B&W photograph, 4 x 5 B&W negative. 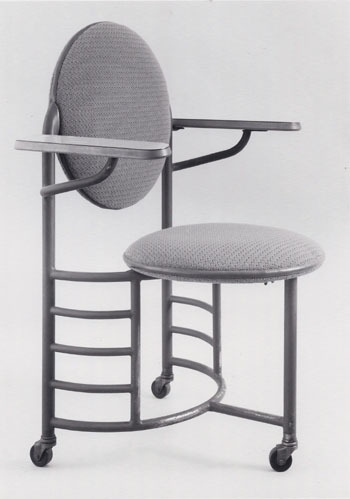 Title: SC Johnson Administration Building Arm Chair (1936 - S.237) 1981. Description: Prototype arm chair with three legs designed by Frank Lloyd Wright in 1936, three-quarter views. Written on verso: "Johnson McArthur Prototype". Warren McArthur Jr., son of one of Wright earliest clients (1892 - S.011), held patents on designs for hollow metal frame elements. He was the brother of Albert McArthur who was once an associate of Wright in Oak Park and designer of the Biltmore Hotel in Phoenix. Warren McArthur Co., New York, manufactured the prototypes. Steelcase Company, Grand Rapids, Michigan, went on to manufacture the furniture. 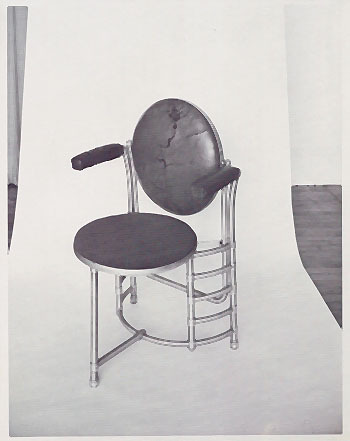 Tubular Aluminum, upholstered seat, leather back and arms. 32 (H) x 19 (W) x 19 (D). Photographed by Thomas Heinz. Acquired from Kelmscott Galleries. 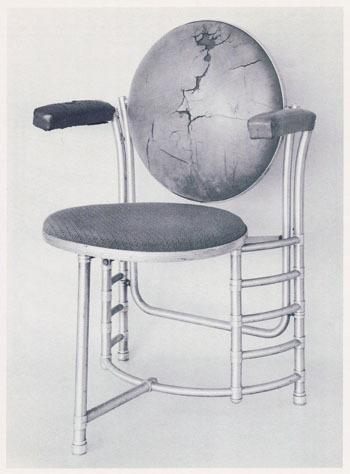 See Wright Designed Chairs. Size: 7.5 x 9.5 B&W photograph. Description: Prototype arm chair with three legs designed by Frank Lloyd Wright in 1936, three-quarter views. Warren McArthur Jr., son of one of Wright earliest clients (1892 - S.011), held patents on designs for hollow metal frame elements. He was the brother of Albert McArthur who was once an associate of Wright in Oak Park and designer of the Biltmore Hotel in Phoenix. Warren McArthur Co., New York, manufactured the prototypes. Steelcase Company, Grand Rapids, Michigan, went on to manufacture the furniture. Tubular Aluminum, upholstered seat, leather back and arms. 32 (H) x 19 (W) x 19 (D). 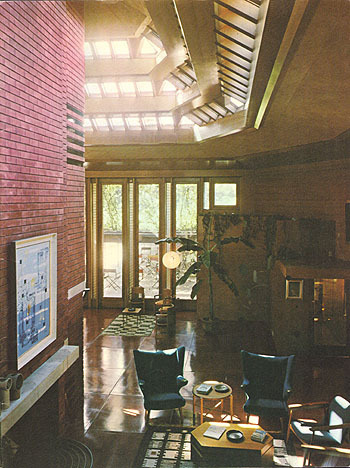 This photograph was published in "Frank Lloyd Wright", Kelmscott Galleries, 1981, page 43. Photographed by Quiriconi-Tropea Photographers. Acquired from Kelmscott Galleries. See Wright Designed Chairs. Size: 7.5 x 10 B&W photograph and 4x5 B&W negative. 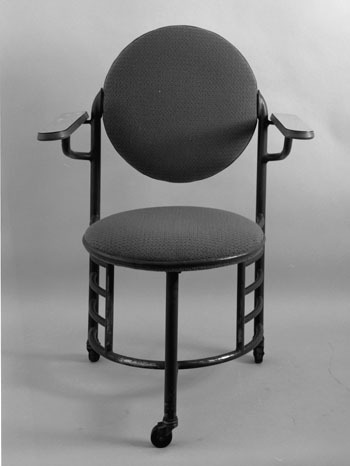 Title: S.C. Johnson & Son Administration Building Arm Chair (1936 - S.237) 1981. Description: Three legged arm chair with wheels, designed by Frank Lloyd Wright in 1936, three-quarter view facing right. Red painted aluminum, upholstered seat and back, wood arms are laminated. 37.5 (H) x __ (W) x 21.125 (D). 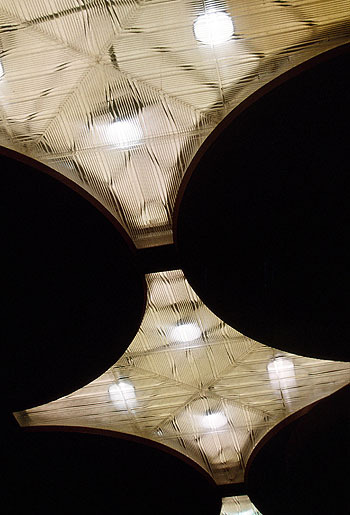 This photograph was published in "Frank Lloyd Wright", Kelmscott Galleries, 1981, page 41. Photographed by Quiriconi-Tropea Photographers. Acquired from Kelmscott Galleries. Size: Two 8 x 10 B&W photographs and one 4x5 B&W negative. 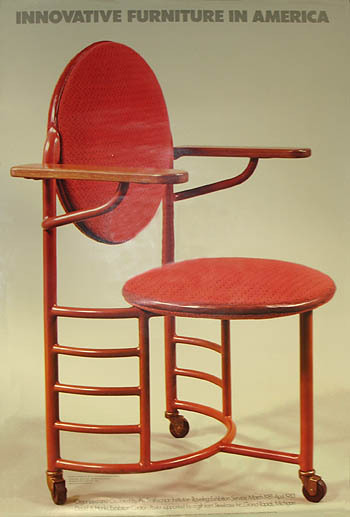 Description: Three legged arm chair with wheels, designed by Frank Lloyd Wright in 1936, three-quarter view facing left. Red painted aluminum, upholstered seat and back, wood arms are laminated. 37.5 (H) x __ (W) x 21.125 (D). Photographed by Quiriconi-Tropea Photographers. Acquired from Kelmscott Galleries. Size: 3.5 x 5 color photograph. 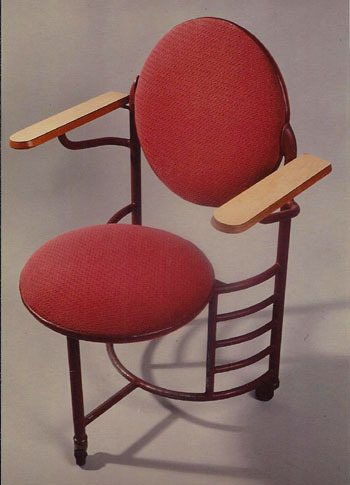 Description: Three legged arm chair with wheels, designed by Frank Lloyd Wright in 1936, facing forward. Red painted aluminum, upholstered seat and back, wood arms are laminated. 37.5 (H) x __ (W) x 21.125 (D). Photographed by Quiriconi-Tropea Photographers. Acquired from Kelmscott Galleries. Size: One 8 x 10 B&W photograph and one 4x5 B&W negative. Title: Herbert F. Johnson Wingspread 1981 (1937 - S.239). Description: View of the home from the South. The swimming pool is in the foreground. The Kitchen is to the left, Living Room is in the center, the children�s bedrooms is to the right. Clipping pasted to verso: "Education and civic leaders from throughout the world share their ideas in the relaxed setting of Wingspread, the Johnson Foundation�s conference center at Wind Point near Racine. Here Leslie Paffrath, the foundation�s president, and Mrs. Barbara Sargeant, program associate, work out details for an upcoming conference beside the pool at the rambling prairie house designed by Frank Lloyd Wright." Stamped on clipping: "Aug 27 1981." 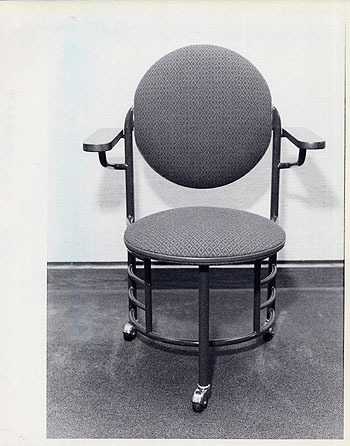 Title: SC Johnson Administration Building Arm Chair (1936 - S.237) 1985. Description: Clipping pasted to verso: "Chair manufactured by the Steelcase company in the late 1930s and designed by Frank Lloyd Wright. Photo by Scott Harmsen." Hand written on verso "7-14-85". Photograph by Scott Harmsen. 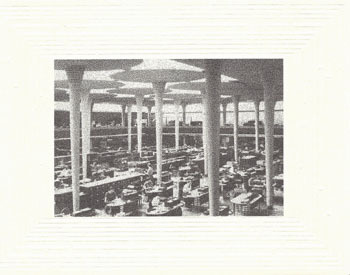 Title: S.C. Johnson & Son Administration Building Great Workroom 1989 (1936 - S.237). 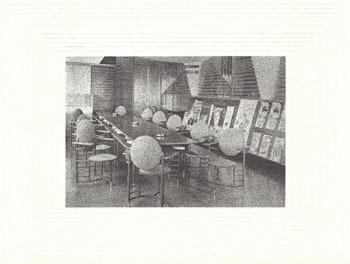 Description: Clipping pasted to verso: "The inside of the Great Workroom of the Administration Building." 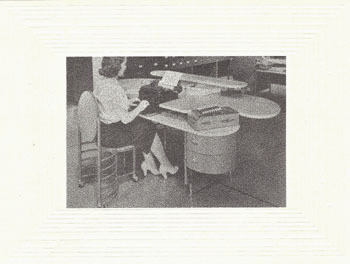 Second clipping pasted to verso: "The Great Workroom of the S. C. Johnson & Sons Inc. Administration building." 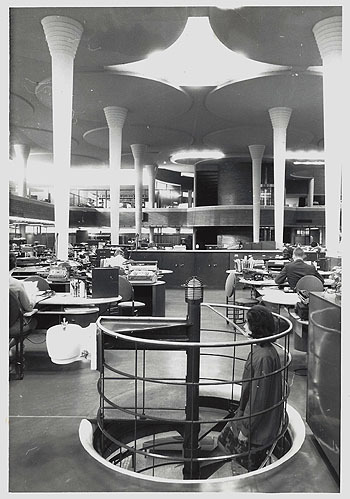 Third clipping pasted to verso: "The Great Workroom, built in 1939 by Frank Lloyd Wright as part of the S.C. Johnson Wax administration building in Racine, was the forerunner today's open office concept." Stamped on verso: "Jul 19 1989." Title: S.C. Johnson & Son Administration Building Entrance Circa 1990 (1936 - S.237). Description: 1) Set of 6 35mm slides. View of the entrance to the campus from the South. 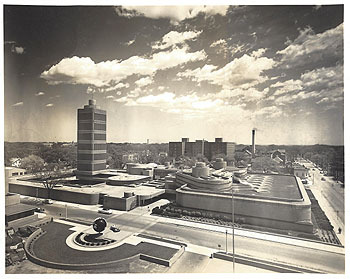 Frank Lloyd Wright designed the Administration Building in 1936, and the Research Tower in 1944. The Research Tower can be seen in the background. Label on sleeve: "Johnson Wax, by FLW, 1936, entry to complex." Photographed by Scot Gilchrist. Size: Original 35mm Color slide and 5 x 8 high res digital image. Description: 2) Set of 6 35mm slides. View toward the main entrance of the Great Workroom. The carport is to the left. The Great Workroom is to the right, Administration offices are on the upper level. 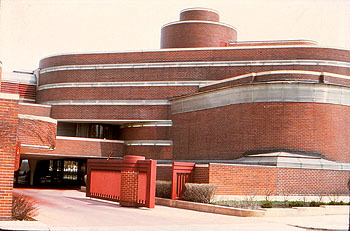 Frank Lloyd Wright designed the Administration Building in 1936. Label on sleeve: "Johnson Wax, by FLW, 1936, exterior wall." Photographed by Scot Gilchrist. Description: 3) Set of 6 35mm slides. View of one the exterior columns outside the entrance. 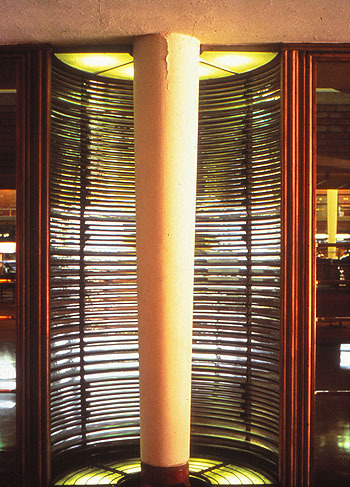 The circular wall is created out of glass tubing. The Great Workroom can be seen in the background. 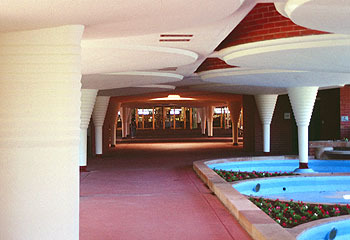 Frank Lloyd Wright designed the Administration Building in 1936. 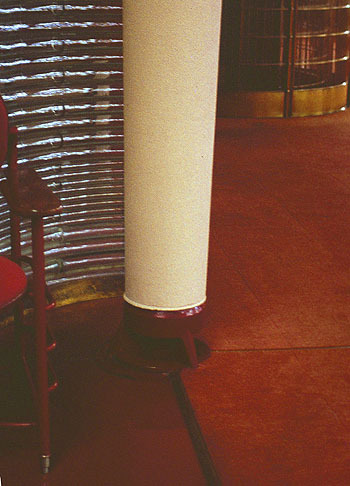 Label on sleeve: "Johnson Wax, by FLW, 1936, column near entry." Photographed by Scot Gilchrist. Description: 4) S.C. Johnson & Son Administration Building Great Workroom Circa 1990 (1936 - S.237). Set of 6 35mm slides. View of the entrance area to the Great Workroom. 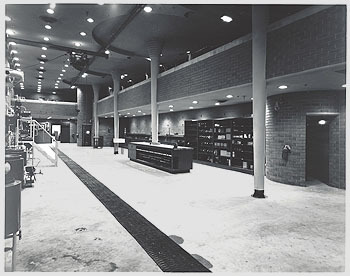 The Lobby can be seen on the left. 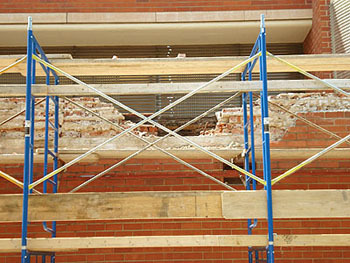 The Lobby can be seen rising an additional floor above the Great Workroom. 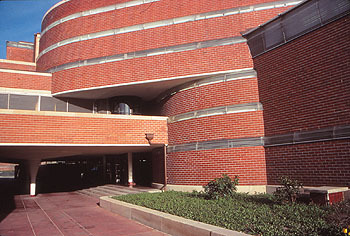 Frank Lloyd Wright designed the Administration Building in 1936. 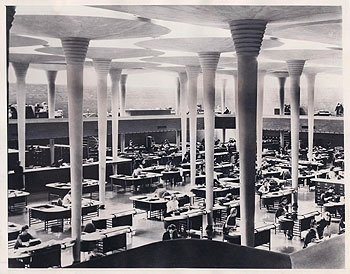 Label on sleeve: "Johnson Wax, by FLW, 1936, interior of admin." Photographed by Scot Gilchrist. Description: 5) S.C. Johnson & Son Administration Building Great Workroom Circa 1990 (1936 - S.237). Set of 6 35mm slides. View of the Great Workroom. 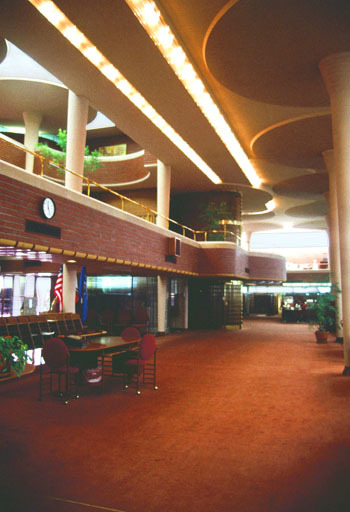 Frank Lloyd Wright designed the Administration Building in 1936. 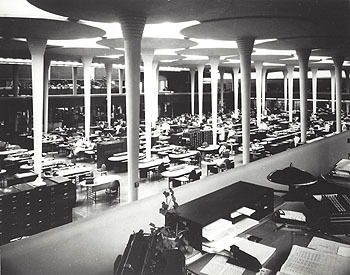 Label on sleeve: "Johnson Wax, by FLW, 1936, interior of admin." Photographed by Scot Gilchrist. Description: 6) S.C. Johnson & Son Administration Building Great Workroom Circa 1990 (1936 - S.237). Set of 6 35mm slides. 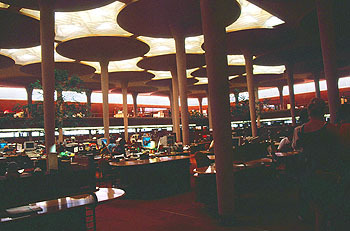 View of the reception area of the advertising department. The Advertising Department is in the Southeast corner of the Research Tower complex. Designed in 1944, the tower complex opened in November 1950. The dome above the reception room is similar to one of the designed first proposed for the Guggenheim Museum (0987.35). 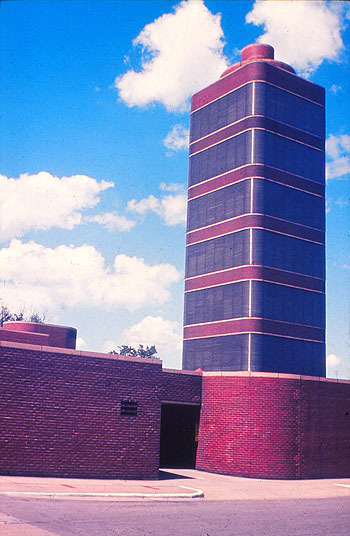 Frank Lloyd Wright designed the Administration Building in 1936, and the Research Tower in 1944. 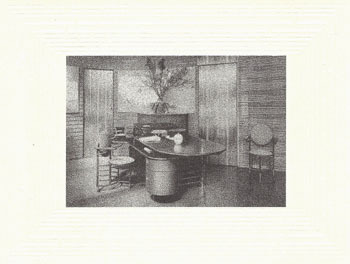 Label on sleeve: "Johnson Wax, by FLW, 1936, interior of reception." Photographed by Scot Gilchrist. Title: Herbert F. Johnson Wingspread 1993 (1937 - S.239). 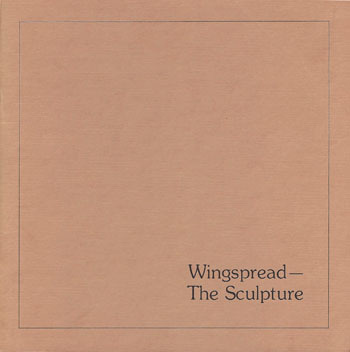 Description: Sculpture at Wingspread. View of "Amanti" by Milton Hebald, one of many sculptures at Wingspread. Clipping pasted to verso: "Amanti," a bronze sculpture of two lovers by Milton Hebald, stands at the entrance to the Wingspread Conference Center at 33 E. 4 mile Road, Wind Point. 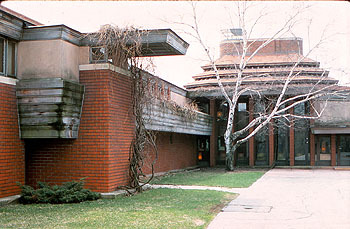 The building was designed by Frank Lloyd Wright as a home for Herbert Fisk Johnson, who turned it into a conference center in 1959. Journal photo by Ronald M. Overdahl." Stamped on clipping: "Jun 8, 1993." Size: Original 7.25 x 10 B&W photograph. Title: S.C. Johnson & Son Administration Building Executive Office 1994 (1936 - S.237). Description: View of the interior of Samuel C. Johnson�s office. 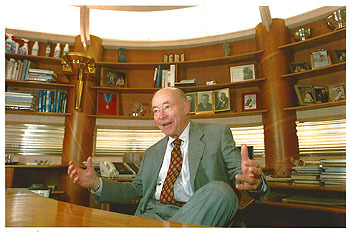 Glass tubing can be seen behind and above Johnson. Hand written on verso: "(Samuel C. Johnson) S.C. Johnson & Son, Inc." and "Sentinel Photo By William Meyer, 10/10/94." Acquired from the archives of the Milwaukee Sentinel. Size: Original 11 x 8 Color photograph. Title: Fallingwater. "Frank Lloyd Wright. A film by Ken Burns and Lynn Novick." Description: Photograph includes Fallingwater, Imperial Hotel, SC Johnson Wax Company Administration Building, Unity Temple. 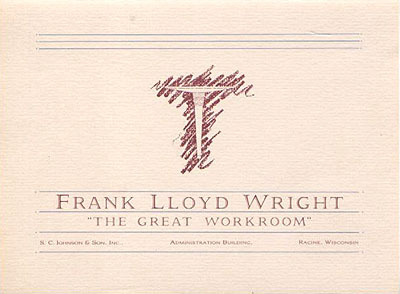 Label on verso: Frank Lloyd Wright. A film by Ken Burns and Lynn Novick. 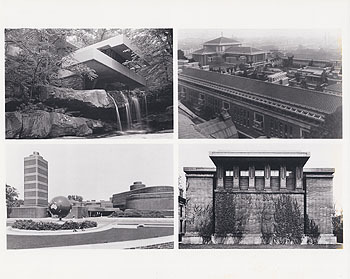 Frank Lloyd Wright Buildings: (top left) Fallingwater in Bear Run, Pennsylvania; (top right) the Imperial Hotel in Japan which has since been demolished; (bottom left) the S.C. Johnson Wax Company Administration Building in Racine, Wisconsin; (bottom right) and the Unity Temple in Oak Park, Illinois, are examples of Frank Lloyd Wright�s work. The brilliant and controversial architect, who revolutionized American architect, is the subject of a new film by Ken Burns and Lynn Novack. �Frank Lloyd Wright�, which interweaves Wright�s extraordinary career with his equally tempestuous personal life, will be broadcast on PBS as a �General Motors Mark of Excellence Presentation, "Tuesday, Nov, 10 and Wednesday, Nov, 11, 1998. 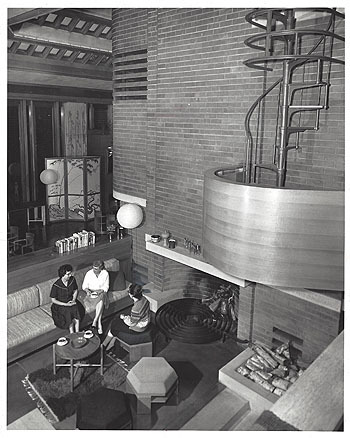 Photo credits: Fallingwater, Courtesy of James Reber and the Frank Lloyd Wright Archives. 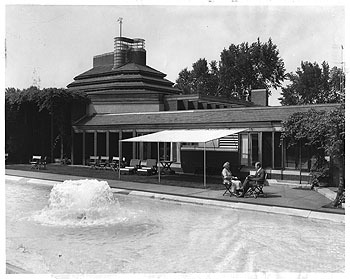 Imperial Hotel, S.C. Johnson and Unity Temple, Courtesy of the Frank Lloyd Wright Archives." Stamped on verso: "Nov 1998". Size: Original 10 x 8 B&W photograph. Individual images 4.75 x 3. Title: S.C. Johnson & Son Administration Building 1998 (1936 - S.237). Description: Set of 16 35mm slides by an unknown photographer. Some images are underexposed, but enhanced. Size: Original 35mm color slide, 12 x 8 High Res digital image. Title: S.C. Johnson & Son Prints by Steelcase, 1987. Description: Set of four prints and envelope of 1939 photographs. Each card has a thick embossed border symbolizing the glass tubing used throughout the Administration building. 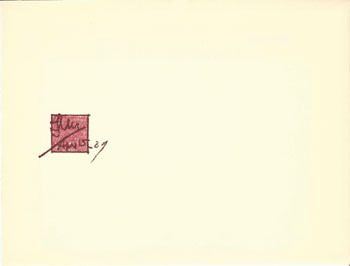 The Envelope is printed with Frank Lloyd Wright�s signature red square, "Frank Lloyd Wright/Apr 15 39." Size: Prints are 8 x 6, and are printed with a mezzotint screen. 1) The Great Workroom. Text on Verso: "The Johnson Wax Building, Racine, Wisconsin. In the Great Workroom, the rounded edges of worksurfaces and the backs and seats of chairs repeat the distinctive lines of Frank Lloyd Wright�s dendriform columns. Steelcase. 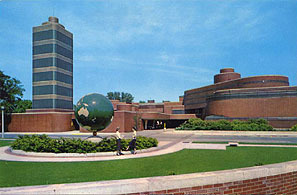 1987 Steelcase Inc., Grand Rapids, Michigan 49501. Form number S-455. 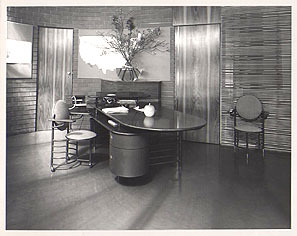 Litho in U.S.A."
2) Desk designed by Frank Lloyd Wright. 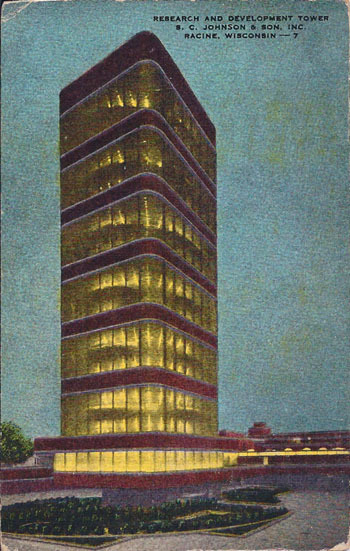 Text on Verso: "The Johnson Wax Building, Racine, Wisconsin. 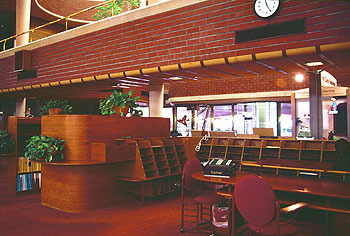 The desks Frank Lloyd Wright designed for the Johnson Wax Administration Building are task-specific, utilizing many of the principles on which today�s systems furniture is based. Steelcase. 1987 Steelcase Inc., Grand Rapids, Michigan 49501. Form number S-455. Litho in U.S.A."
3) Conference Room. 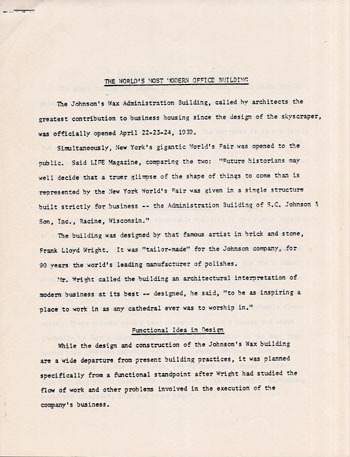 Text on Verso: "The Johnson Wax Building, Racine, Wisconsin. The multi-level worksurfaces and rounded shapes that architect Frank Lloyd Wright employed throughout the building are repeated in the armchairs and table that furnish a conference room. Steelcase. 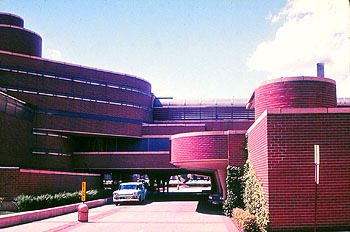 1987 Steelcase Inc., Grand Rapids, Michigan 49501. Form number S-455. Litho in U.S.A."
4) Executive Office. 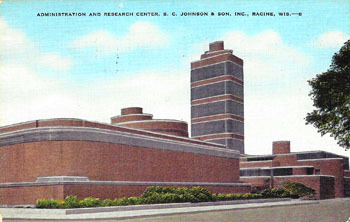 Text on Verso: "The Johnson Wax Building, Racine, Wisconsin. A penthouse executive office is furnished with desk and chairs designed by Frank Lloyd Wright, and manufactured by Steelcase.. Steelcase. 1987 Steelcase Inc., Grand Rapids, Michigan 49501. Form number S-455. 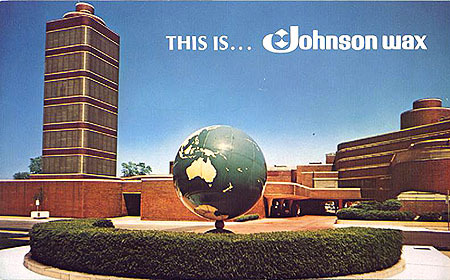 Litho in U.S.A."
SC Johnson & Son Administration Building. Set of 12 lithograph prints (printed on a printing press, not photographically). Tours were available at the S.C. Johnson & Son in 1988 at cost $8.00 per person. SC Johnson & Son handed out a tour booklet and these prints during the tour. 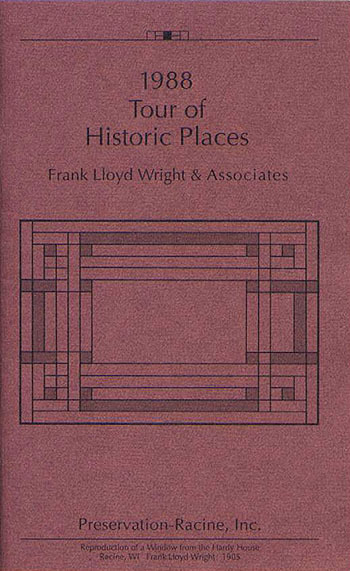 Tour booklet included five sites: Wingspread, the Golden Rondelle, the Johnson Wax building, the Prairie School, and St. Patrick's Church. Title: Print 1) SC Johnson Administration Building Great Room, 1939 (1936 - S.237). 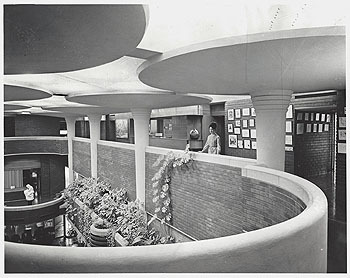 Title: SC Johnson Administration Building Lobby (1936 - S.237) 1939, viewed from the East, second level. Description: Print 2) Designed in 1936, the official opening of the SC Johnson Administration Building spanned three days, April 22-24, 1939. It has been called the greatest contribution to business housing since the design of the skyscraper. Monolithic dendriform columns had a metal base embedded in the floor. Golf tee in shape, the base has a diameter of 9 inches, gradually widen to 2 feet 10 inches at the top, then spread out to a diameter of 18 feet 6 inches. The tallest columns are in the lobby at 31 feet tall, and the great room which are 21 feet 7.5 inches high. Published in "Frank Lloyd Wright and the Johnson Wax Building", Lipman, 1986, p.50. Title: Print 3) SC Johnson Administration Building detail of the Lobby, 1939 (1936 - S.237), viewed from the ground level. Size: 8 x 10 lithograph print. Title: Print 4) SC Johnson Administration Building detail of the Lobby, 1950 (1936 - S.237), viewed from the ground level. Description: Designed in 1936, the official opening of the SC Johnson Administration Building spanned three days, April 22-24, 1939. It has been called the greatest contribution to business housing since the design of the skyscraper. Monolithic dendriform columns had a metal base embedded in the floor. Golf tee in shape, the base has a diameter of 9 inches, gradually widen to 2 feet 10 inches at the top, then spread out to a diameter of 18 feet 6 inches. The tallest columns are in the lobby at 31 feet tall, and the great room which are 21 feet 7.5 inches high. 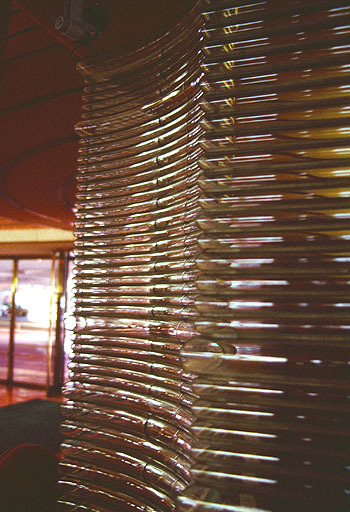 Image published in "Frank Lloyd Wright and the Johnson Wax Building", Lipman, 1986, p.102. 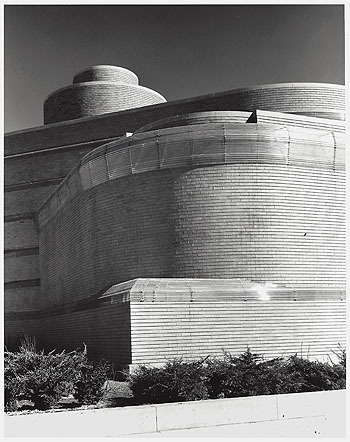 Title: Print 5) SC Johnson Research Tower (1944 - S.238) 1950, viewed from the Northwest, inside the courtyard. Title: Print 6) SC Johnson Research Tower complex (1944 - S.238) 1950, viewed from the Southwest, across the rooftop of the new Research Tower complex. Description: The Research Tower is to the left out of the picture. The flora pond is in the foreground. The walkway bridge extends from the original Administration Building to the new complex that also included the advertising department. The glass done covers the lobby of the reception area of the advertising department. 8 x 10 lithograph print. Two copies. Title: Print 7) Frank Lloyd Wright visits SC Johnson Administration Building (1936 - S.237), overlooks Lobby from third floor balcony 1950. Title: Print 8) SC Johnson Administration Building Great Room (1936 - S.237) Circa 1950. Title: Print 9) SC Johnson Administration Building Great Room, 1939 (1936 - S.237). Set of prints circa 1988. Description: Viewed from the Northern end, looking East. Designed in 1936, the official opening of the SC Johnson Administration Building spanned three days, April 22-24, 1939. It has been called the greatest contribution to business housing since the design of the skyscraper. Monolithic dendriform columns had a metal base embedded in the floor. Golf tee in shape, the base has a diameter of 9 inches, gradually widen to 2 feet 10 inches at the top, then spread out to a diameter of 18 feet 6 inches. The tallest columns are in the lobby at 31 feet tall, and the great room which are 21 feet 7.5 inches high. Photographed after handrails were added to the short walls around the second level. 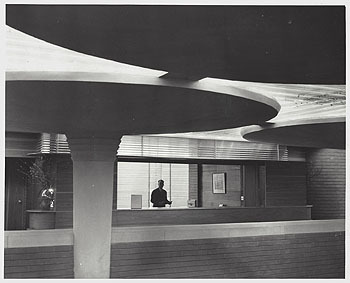 Title: Print 10) SC Johnson Advertising Department Reception Room (1944 - S.238) 1950. 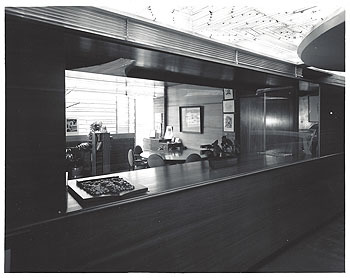 Title: Print 11) SC Johnson Advertising Department Reception Room (1944 - S.238) 1950. 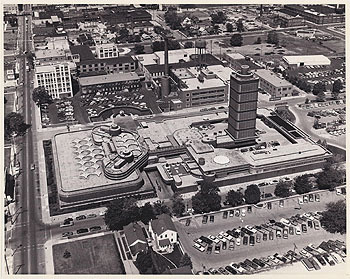 Title: Print 12) SC Johnson Administration Building (1944 - S.238) aerial view circa 1970. Description: Aerial view in "Frank Lloyd Wright and the Johnson Wax Building", Lipman, 1986, p.162-3, is dated 1961. Parking lot in foreground was filled with homes in 1961. Building just to the right of the tower in 1961 has also been torn down and paved. Two copies. Title: SC Johnson & Son, Inc. (Published by S.C. Johnson & Son, Inc.). Description: "An authentic original in the world�s modern architecture. The new headquarters office of S.C. Johnson & Son, Inc. Makers of Johnson�s Wax, Racine, Wis. Designed by Frank Lloyd Wright." Title: S.C. Johnson & Son, Inc. Description: �1975 - The Offices of S.C. Johnson & Son, Inc., Racine Wisconsin.� #9A-H1645. Back: �C.T. Art-Colortone�. PM 11/30/40. Title: S.C. Johnson Research Tower at night (1944 - S.238) circa 1950. Description: Face: "Research and Development Tower. S. C. Johnson & Son, Inc. Racine, Wisconsin � 7. Back: "Twilight view of the famous Research and Development Tower at the home of Johnson�s Wax in Racine, Wisconsin. The building is only 13 feet across at the narrowest point at the base. Natural Color Post Card Made in U.S.A. by E. C. Kropp Co., Milwaukee, Wis. - BCL. 2765N. Stamp box: E C K Co., A natural color Post Card." The Research Tower was designed in 1944, construction began in 1947 and the opening ceremony was held on November 17, 1950. Title: S.C. Johnson Administration Building and Research Tower Circa 1950 (1944 - S.238). Description: Face: "Administration and Research Center. S. C. Johnson & Son, Inc. Racine, Wisconsin � 8. 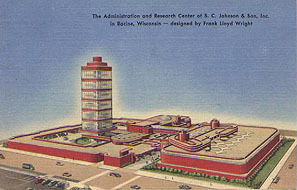 Verso: "The famous Administration and Research Center of S. C. Johnson and Son, Inc., in Racine, Wisconsin, designed by Frank Lloyd Wright. The glass and brick tower is the tallest cantilever construction in the world. Natural Color Post Card Made in U.S.A. by E. C. Kropp Co., Milwaukee, Wis. - BCL. 2767N." The Research Tower was designed in 1944, construction began in 1947 and the opening ceremony was held on November 17, 1950. Description: �The Administration and Research Center of S. C. Johnson & Son, Inc. in Racine, Wisconsin - designed by Frank Lloyd Wright.� Genuine Curteich-Chicago �C.T. Art-Colortone� In 1931 a new printing process was developed, and this style added another letter after the decade letter. An �H� was added if the card was printed using the �Art Colortone Method� also called linen cards. 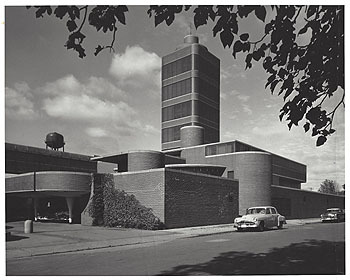 Title: "Johnson�s Wax Administration & Research Center, Racine, Wisconsin. Description: Designed by Frank Lloyd Wright." (Published in 1954 by Curt Teich. Curteichcolor #D-12119. 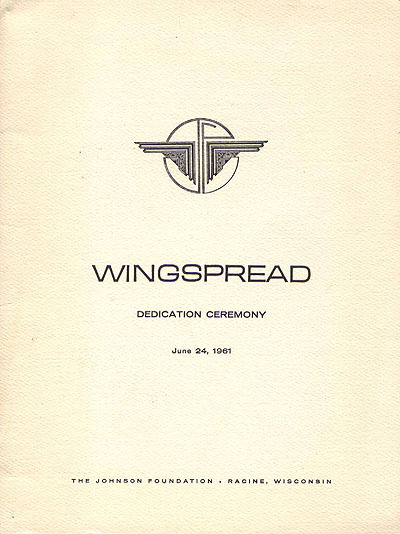 Description: "Aerial view of Wingspread. 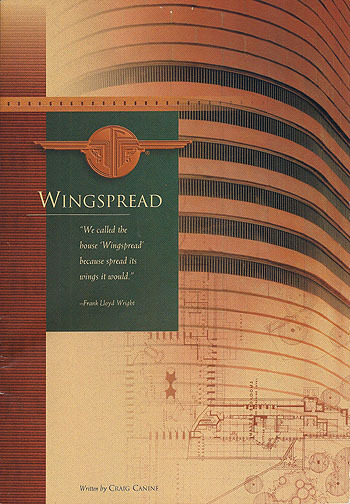 Wingspread, completed in 1939, was designed by Frank Lloyd Wright. Built as a residence for H.F. Johnson, Wingspread is now an international educational conference center maintained by The Johnson Foundation in Racine, Wisconsin. Thomas A. Heinz photograph." Description: "The central chimney features five fireplaces. Wingspread, completed in 1939, was designed by Frank Lloyd Wright. 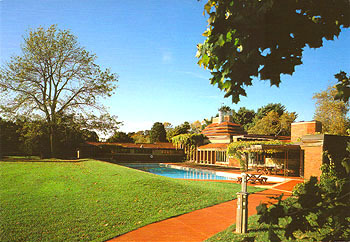 Built as a residence for H.F. Johnson, Wingspread is now an international educational conference center maintained by The Johnson Foundation in Racine, Wisconsin. Thomas A. Heinz photograph." Description: "The east and south wings of Wingspread. 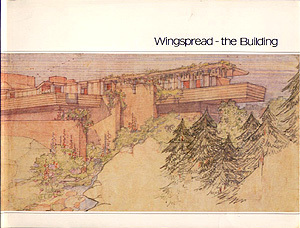 Wingspread, completed in 1939, was designed by Frank Lloyd Wright. 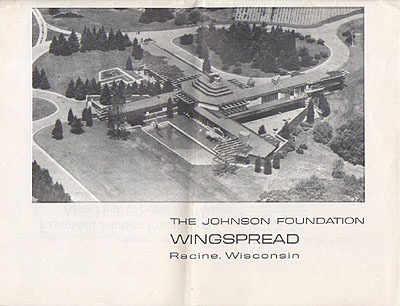 Built as a residence for H.F. Johnson, Wingspread is now an international educational conference center maintained by The Johnson Foundation in Racine, Wisconsin. Thomas A. Heinz photograph." Author: S. C. Johnson & Son, Inc.